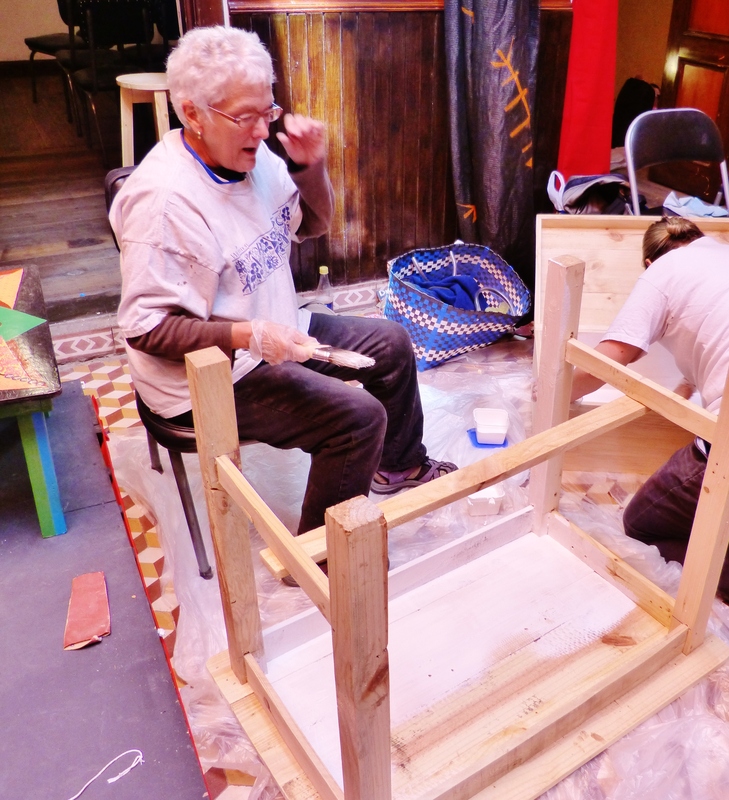 Furniture Artists Workshop in Cuenca, Ecuador: The Results–Stunning! 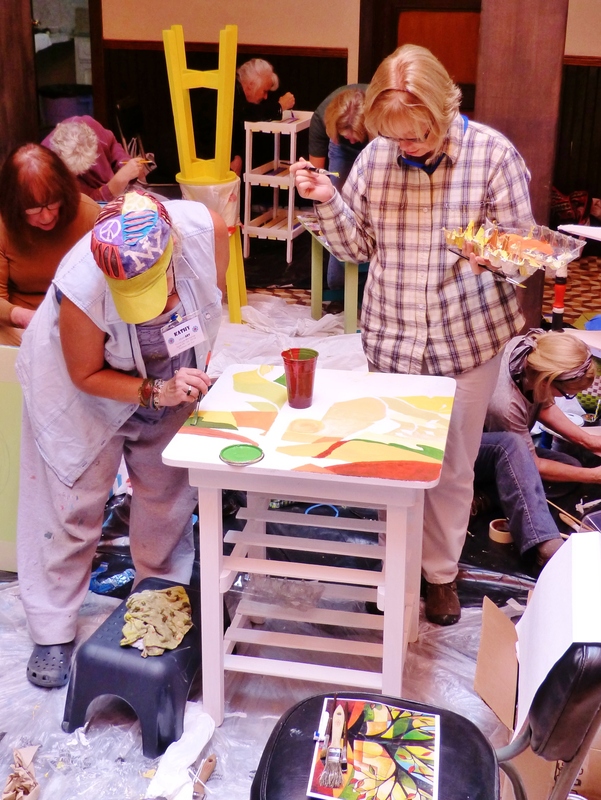 Last week Sara and I taught a five-day workshop on transforming ordinary furniture into extraordinary art. 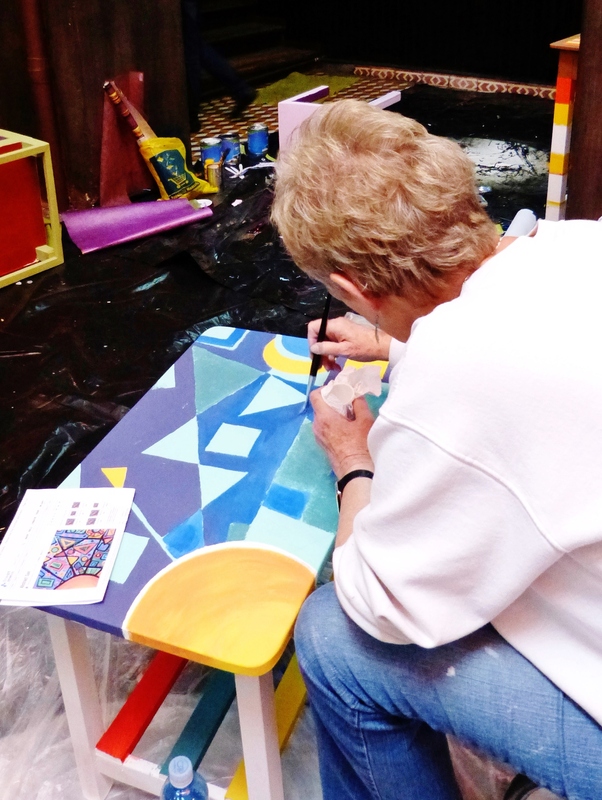 As you might expect, it’s always exciting to share the creative process with others, to encourage risk-taking with color and design, and to nurture the artist, not only in myself, but also in my students. Since creativity motivates me, since it allows me to dream, grow, and explore, I love to pass along my enthusiasm and watch others uncover the creative parts of themselves. Let’s face it. Creativity enriches. It nurtures. It endures. However, as that last item suggests, sometimes the creative process involves more sweat and effort than we bargain for, and the beauty we seek remains elusive. Still, creativity compels us to chase that illusion. It means making a fleeting image of potential loveliness real, actualizing it, so it stands still long enough for us to touch it, feel it, know it—in a tangible and transformative way. 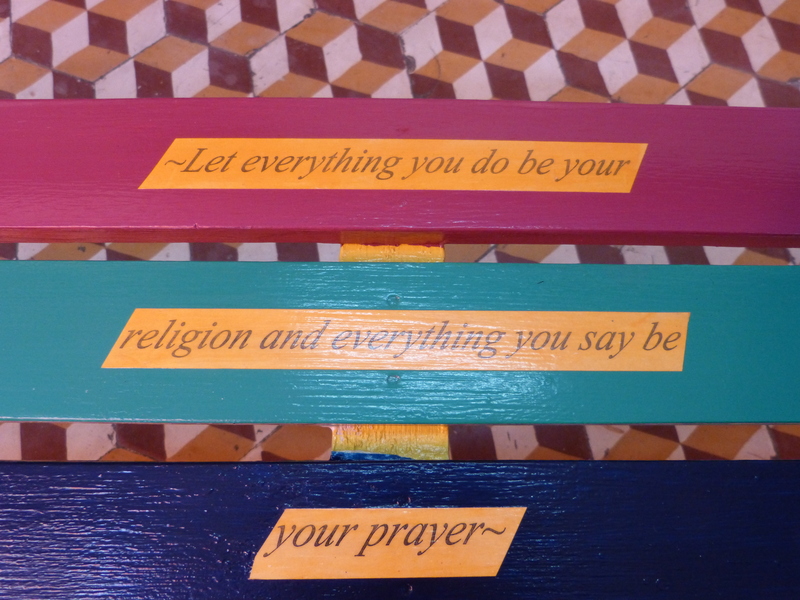 In our workshop last week, we watched participants do just that. To be honest, we were stunned by the response we received when enrollment opened, so we extended our initial limit of 20 participants to 22, still turning away as many as 8. Those lucky 22, 21 woman and one very brave man, amazed us even more than the numbers initially had. These folks were brilliant, creative, daring, willing to take risks, try new techniques, and sometimes create their own. We were blessed to make new friends and learn more from our students than, surely, they did from us. Isn’t that often how it happens? 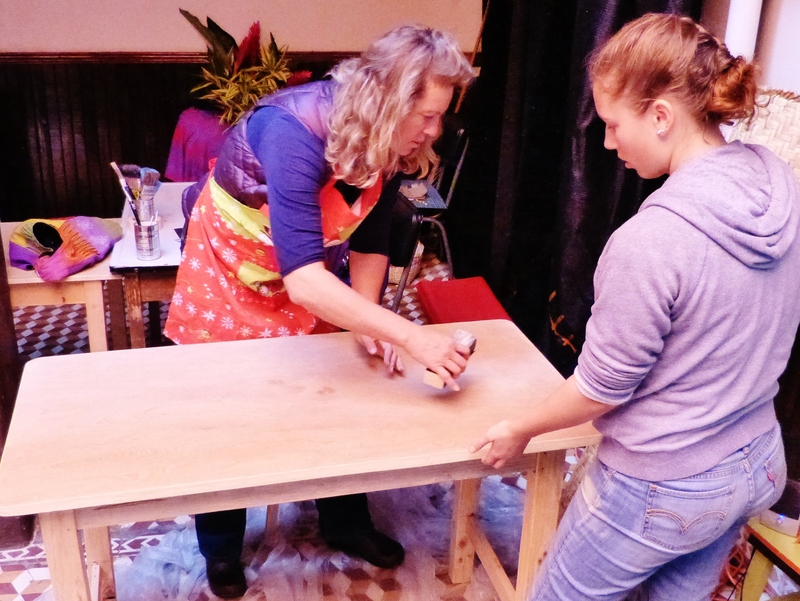 The week began with introductions and instruction, which were then followed by a trip to a local market, so participants could purchase affordable pieces of raw, wood furniture to reinvent. 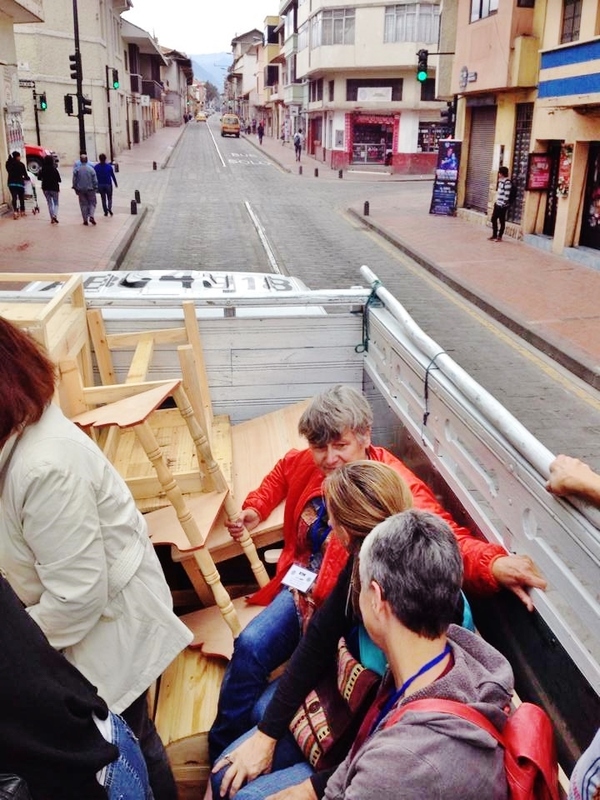 The return trip from this shopping excursion looked like this—a group of gringos, riding in the back of a truck, through the streets of the old city of Cuenca, known as el Centro. Thanks to Stu McNicol for this photo. Soon, however, folks got to work, sanding, priming, and transforming, using a myriad of techniques. Valeri sands her corner shelf. 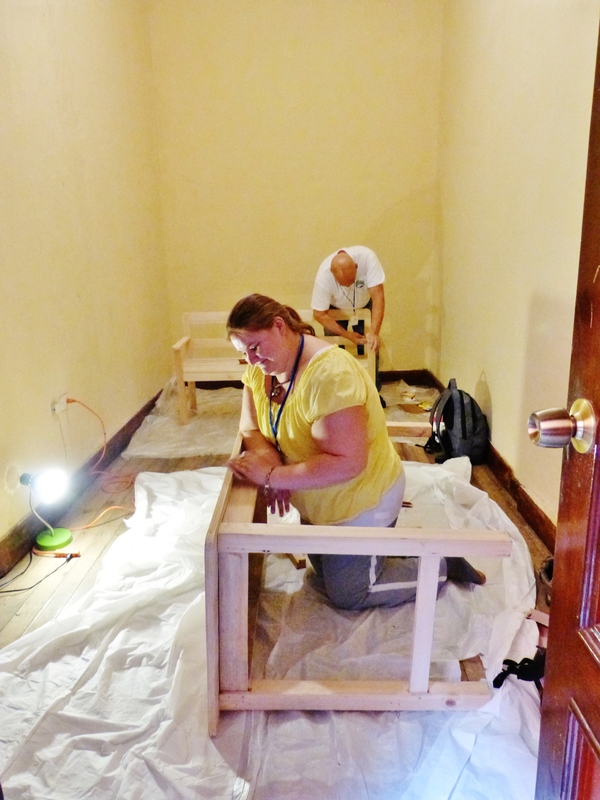 Back in what came to be known as the “Man Cave and Diva Den,” our group’s only male and his buddy Deborah did some sanding of their own. We trust you’ll enjoy this gallery of images, memories of what made the week special, photos that say more about our week than words could ever hope to. So, sit back, relax, and enjoy the journey. 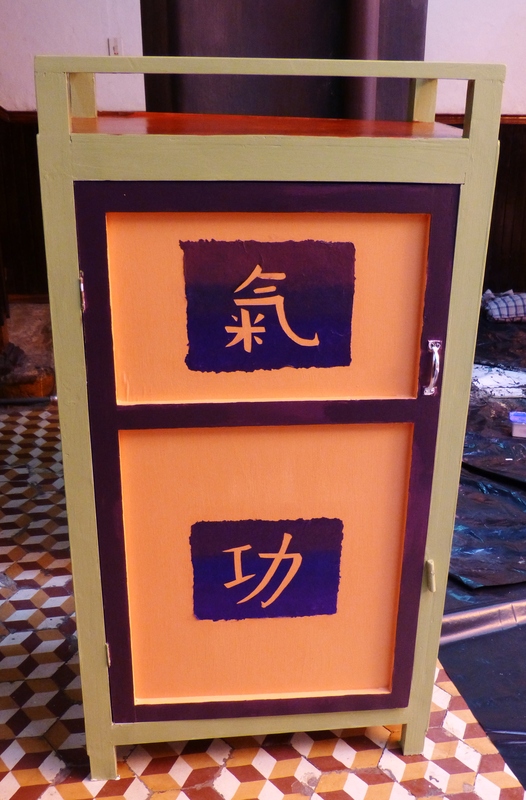 A number of folks did decorative painting. Among them was Rita. 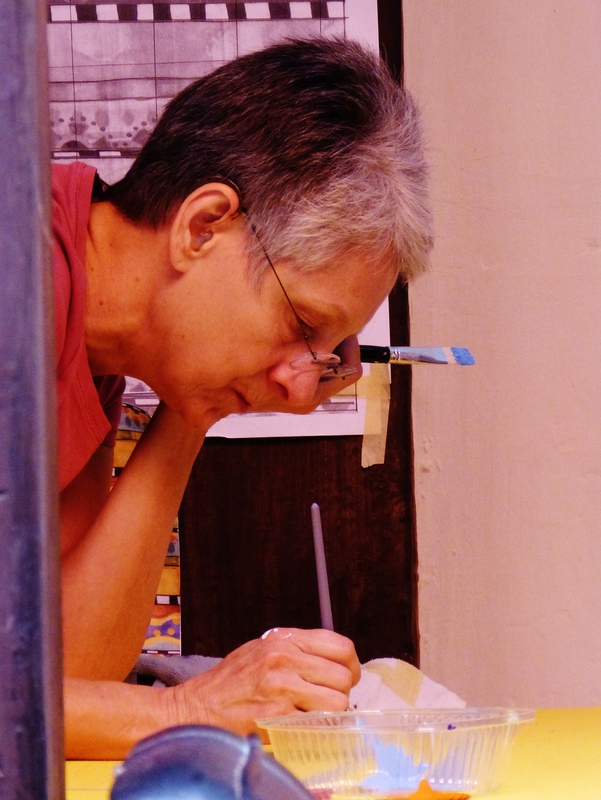 Take a look at her process. Thanks to Rita for this photo. 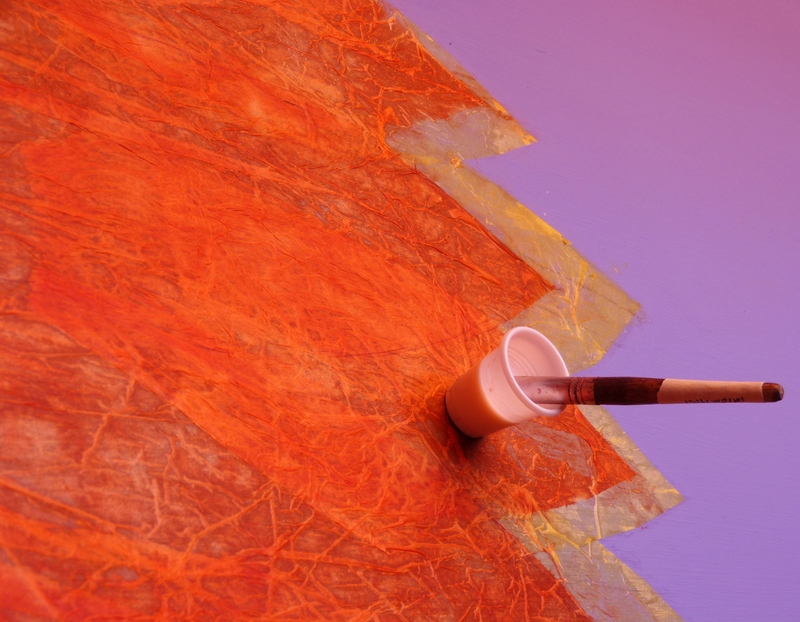 Sheila also used paint primarily, but she got especially smart in her use of tape. 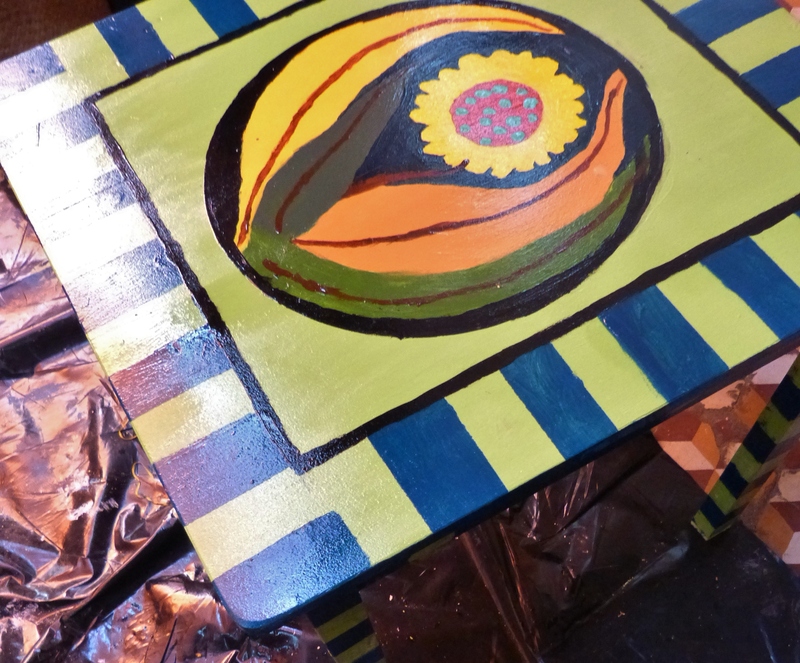 Anne also painted her table, but you will see how her work in a folk art gallery impacted her piece. Isn’t it lovely? 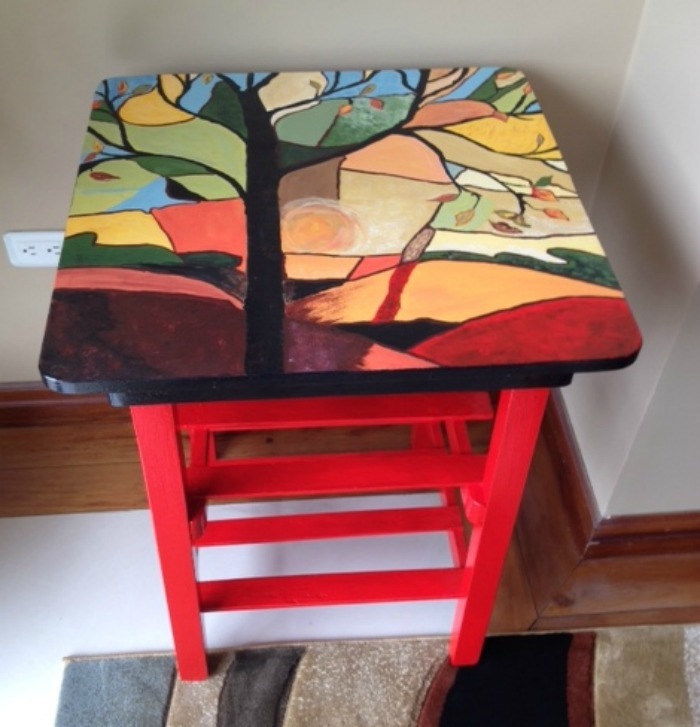 Thanks so much to Anne for this photo of her table in its new home! 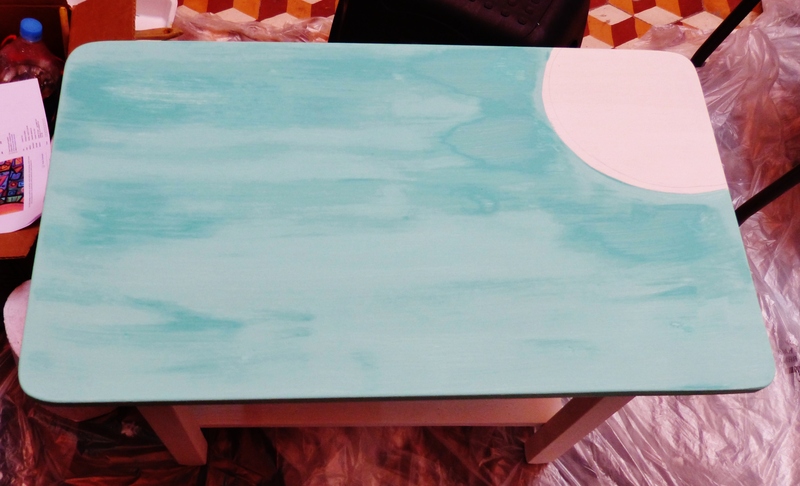 Barbara and Christine used similar colors on their table and chest. 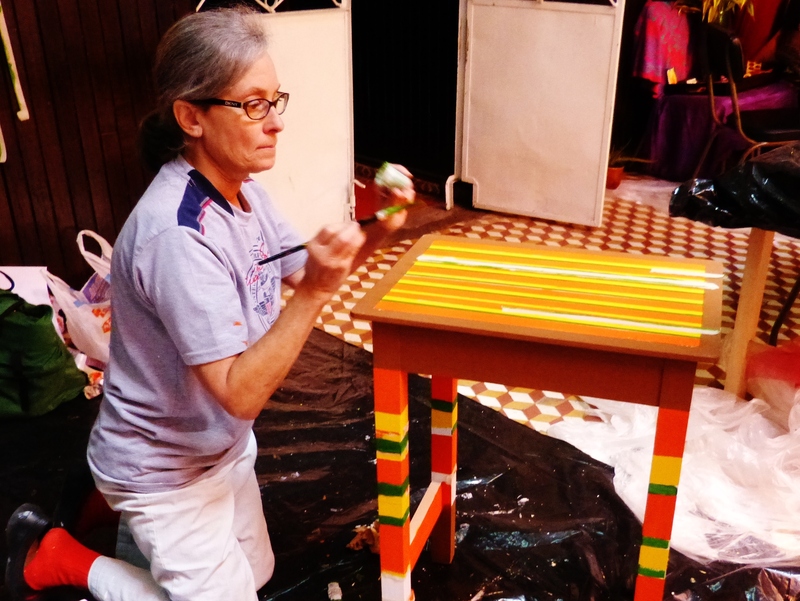 Brenda took on an enormous task, one that she performed brilliantly. Notice the egg carton as palette. 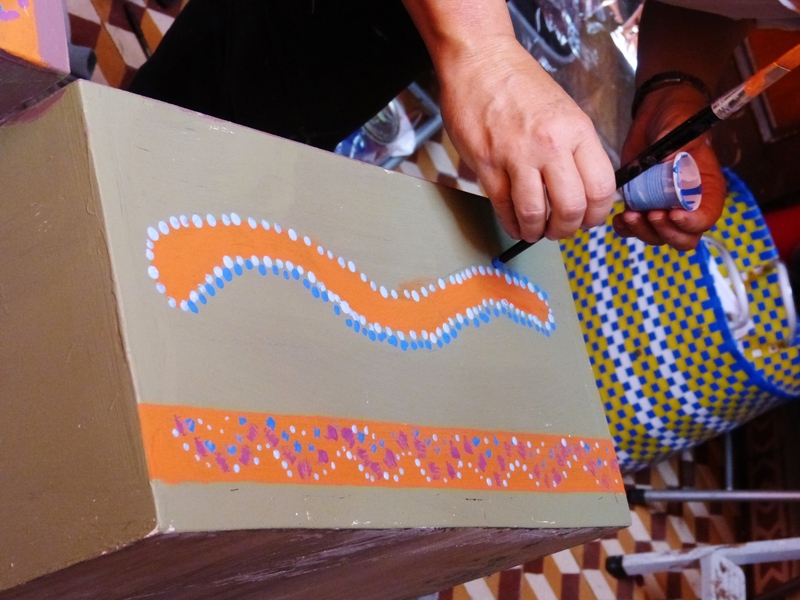 Karen considered stenciling but did decorative painting in the end. Her plant stands were stunning. 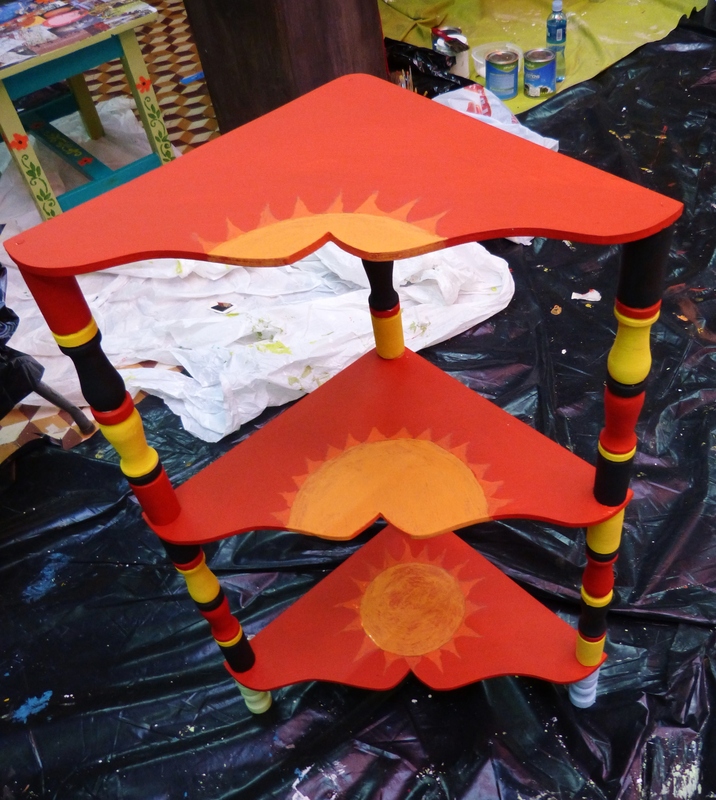 Valeri painted her corner shelf with a series of setting suns–brilliant idea! 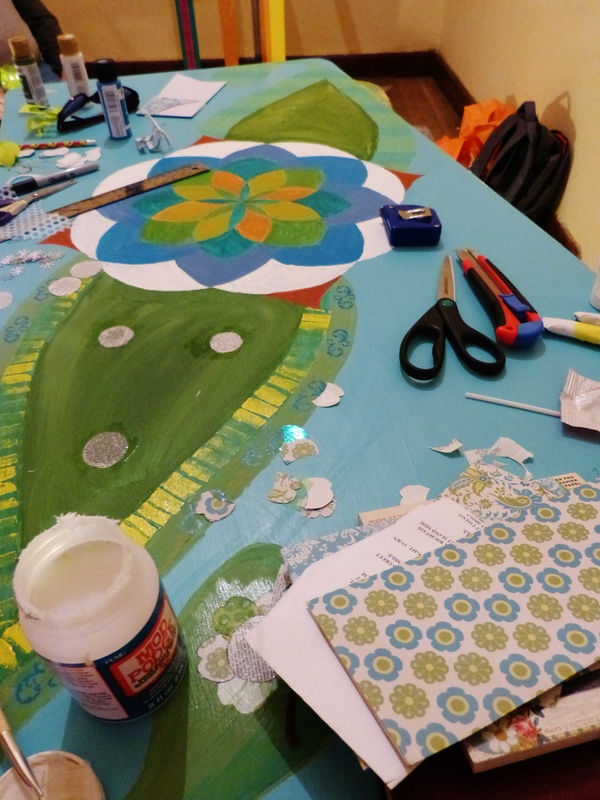 However, a number of folks combined decorative painting and decoupage. Dear Jani was one of those. Thanks to Laura Inks Bodine for this photo. Jan took on a similar challenge. Jan’s table in its new home. It was designed to coordinate with her bedspread. Thanks to Stu for this photo! 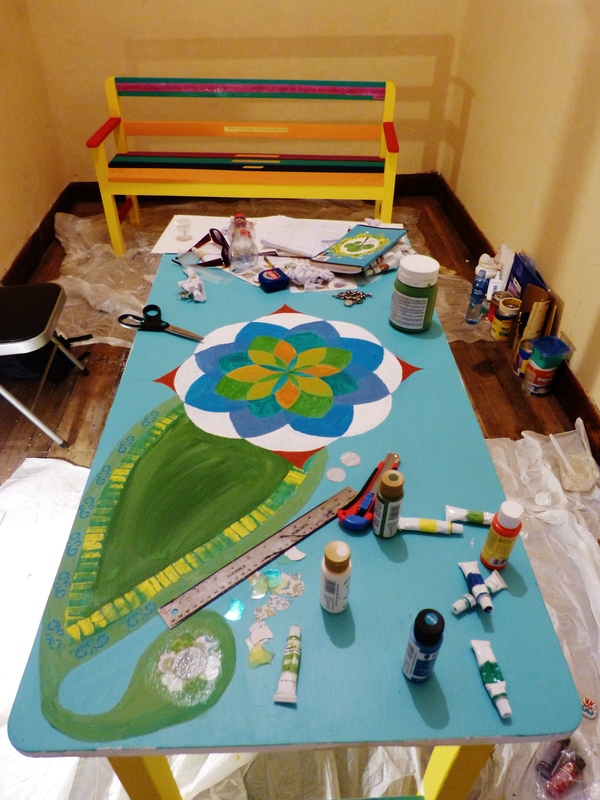 Deborah may have shared Stu’s work space, but her table had a different look. 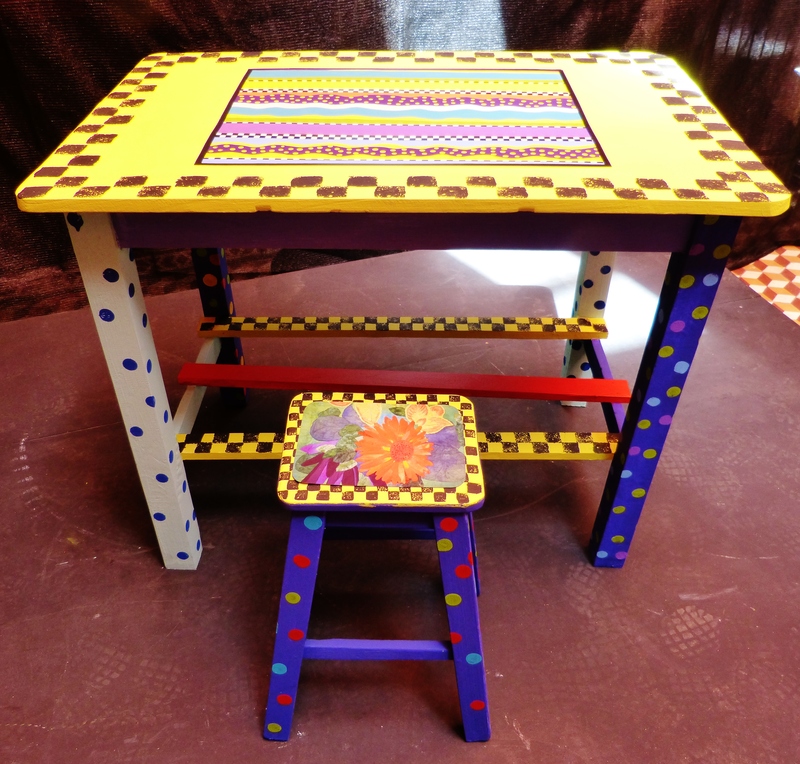 Donna added a decoupaged top to her hand-painted table. 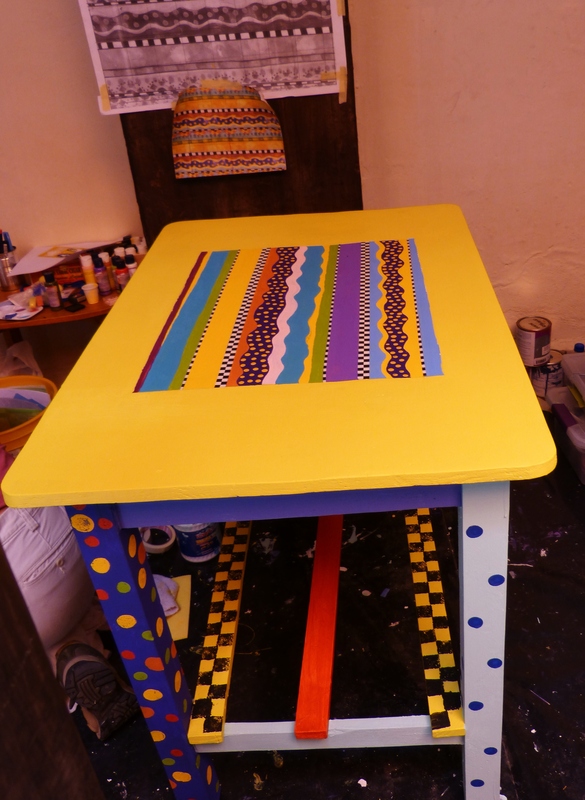 Our other Brenda did an amazing job recreating a fabric design she loves onto the top of what will soon be her sewing table. 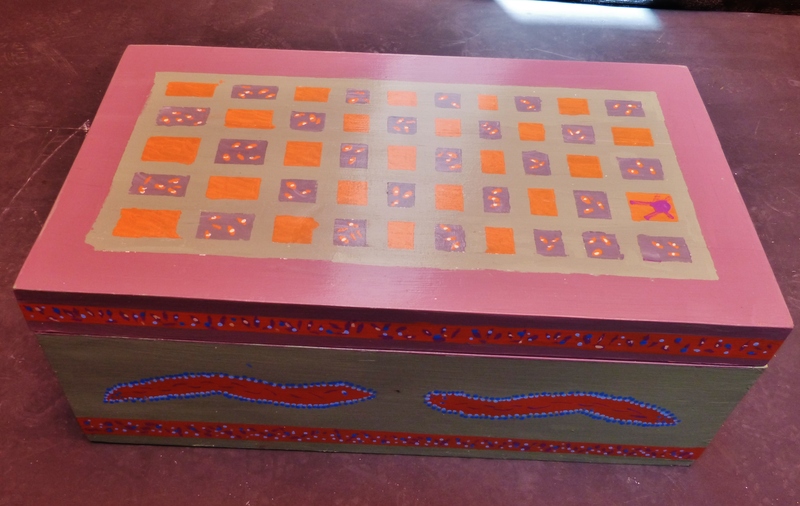 Knitter Judith transformed an ordinary wooded box into a stunning place to store yarn. Conceptually sophisticated, her design featured a repeated image that became a checker board border and half circles cut from knitting patterns that created an additional black and white “ruffle,” of sorts. 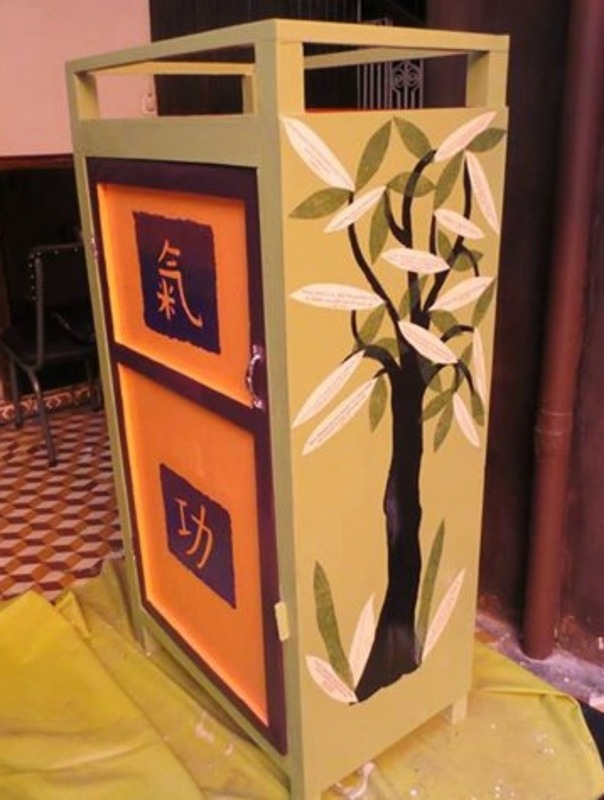 Paper artist Kim, who is soon opening her own studio in Cuenca, added a decoupaged tree to her hand-painted armoire, a piece designed to store art supplies. What an incredible project! Regina and Bobbi worked side by side all week. 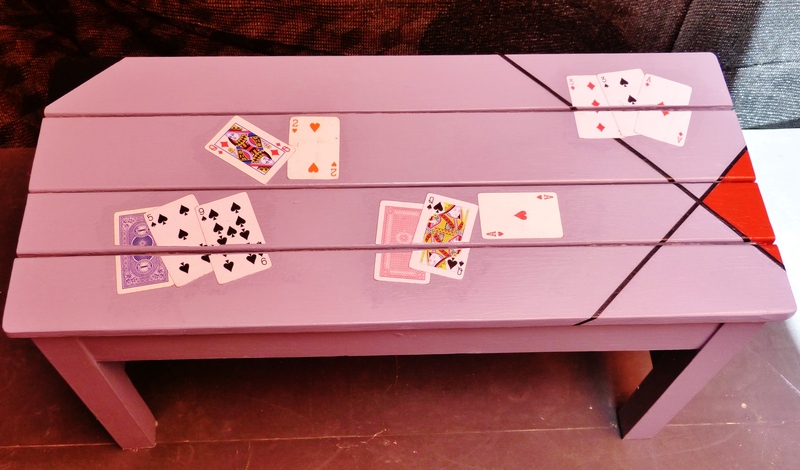 Regina recycled playing cards she’d collected on the street to create a stunning bench for her apartment’s entrance. 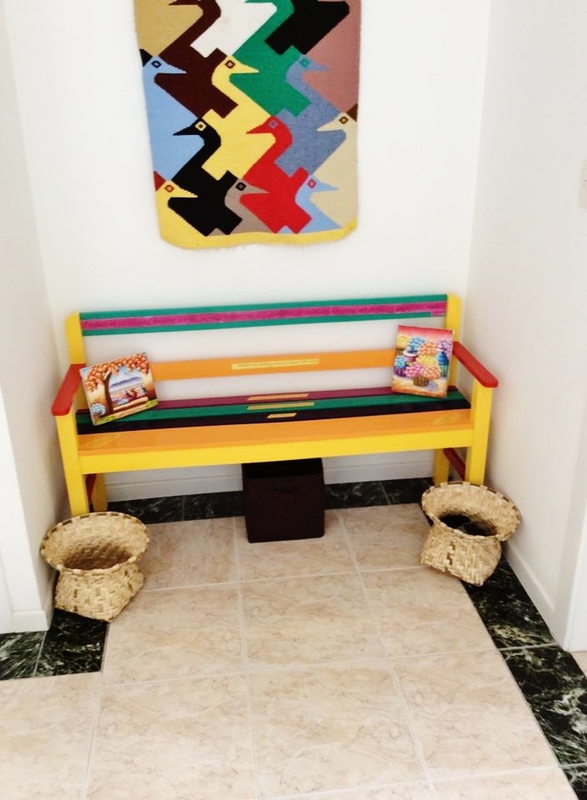 Thanks to Regina for this photo of her bench in its new home! Bobbi, on the other hand, upcycles fabric remnants into stunning clothing. 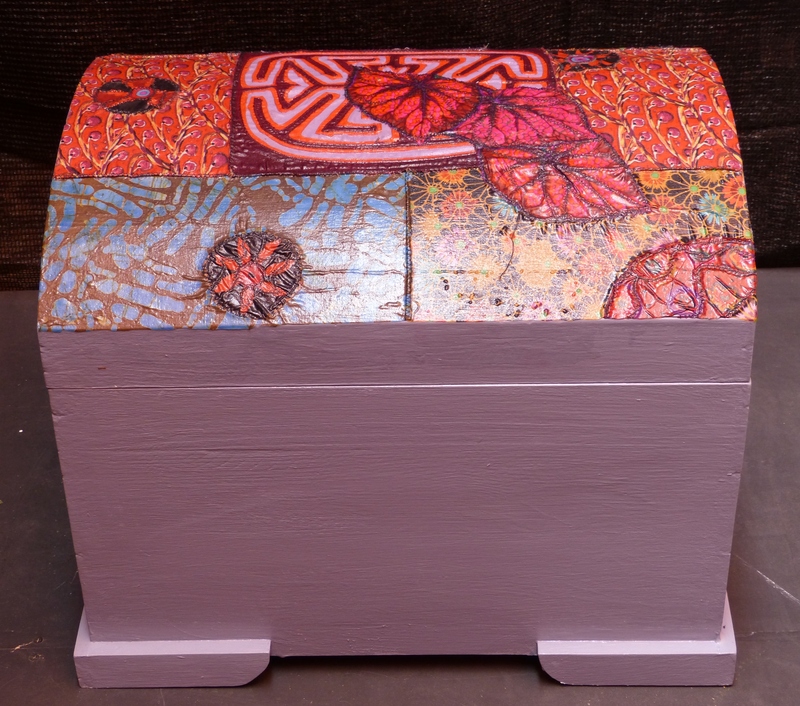 Last week, however, she decoupaged one of her fabric assemblages to the top of wooden chest. The result was stunning. 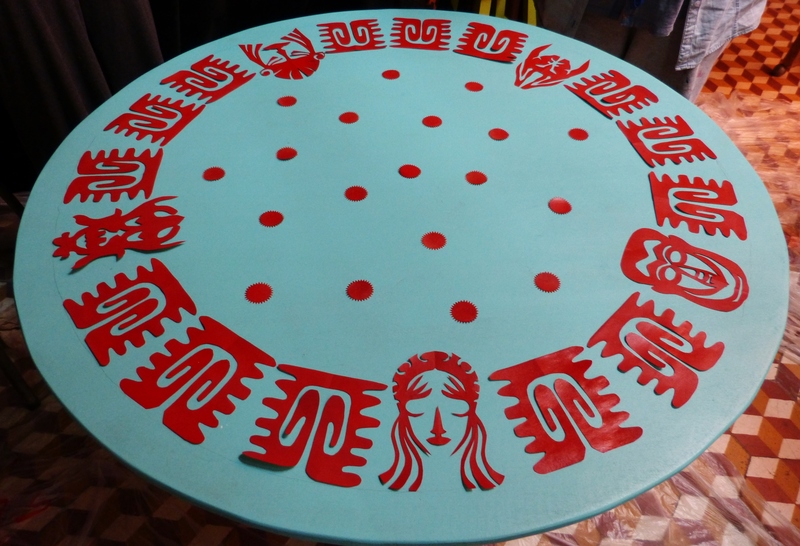 My friend, studio host, and fellow Pittsburgher Laura cut Incan masks from paper, spray painted the paper red, and then decoupaged the masks to a blue table top. The result was spectacular. 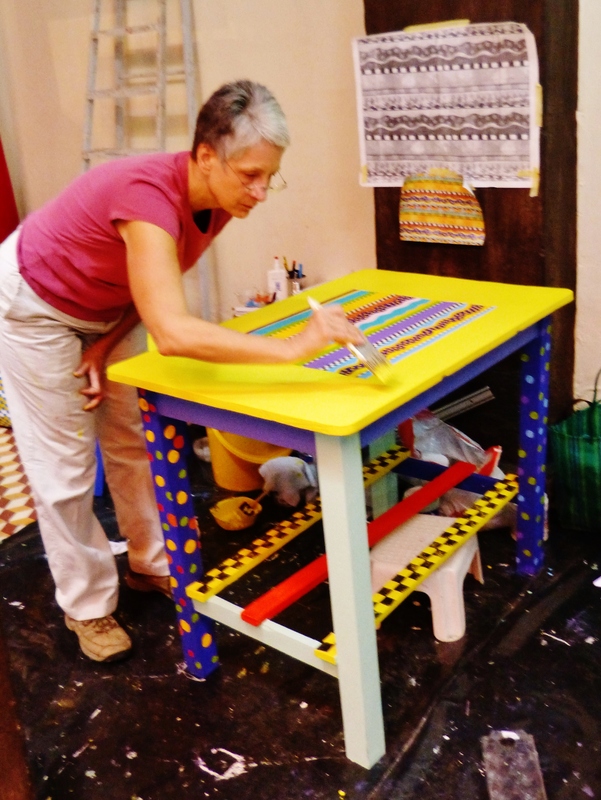 Laura’s table finds a home in her studio loft. 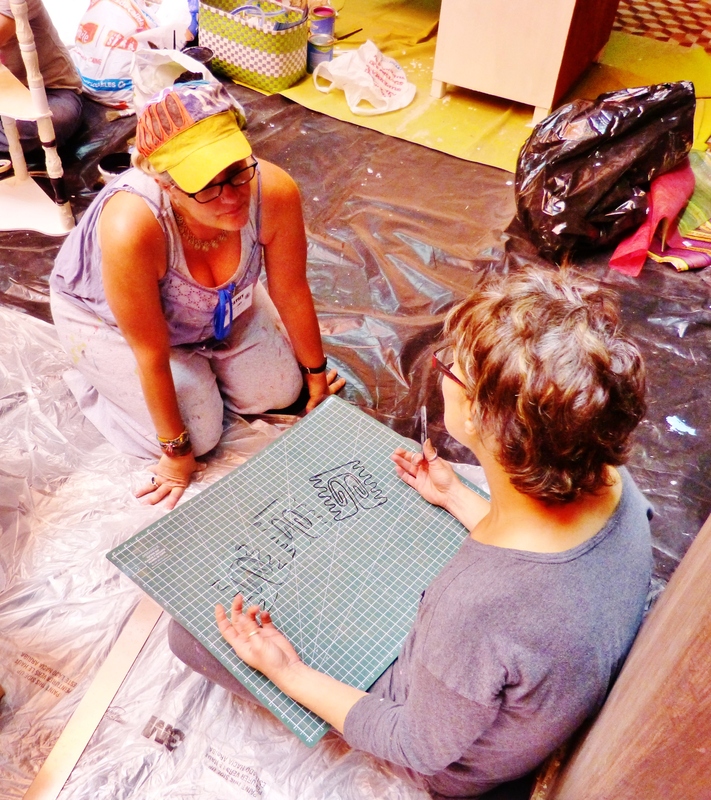 A mother-daughter pair, Michelle and Page, created our final piece by decoupaging tissue paper to a painted table top. The resulting sunflower amazed all of us! 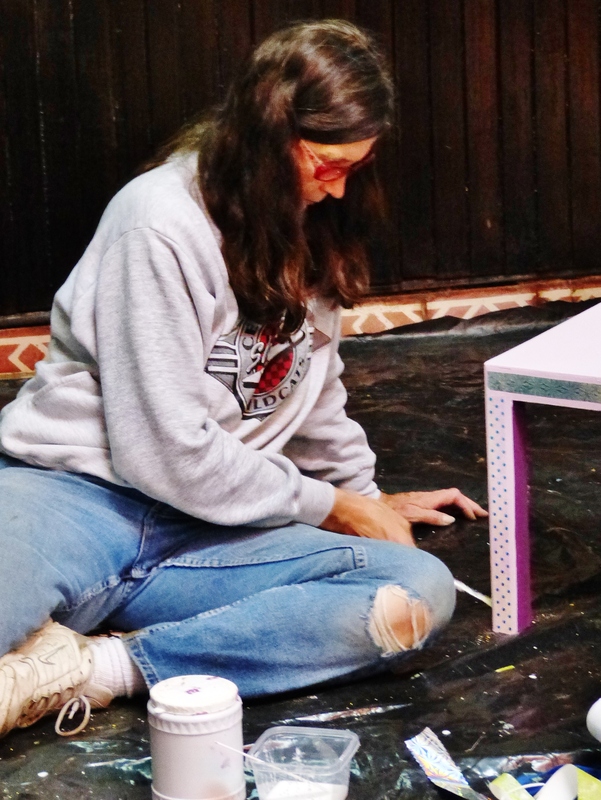 The week of workshopping surpassed our wildest imaginings, as indeed, these amazing and creative folks transformed ordinary furniture into jaw-dropping works of art. They inspired Sara and me to dream bigger, bolder, and more enduring dreams. They gave us the greatest gift. They opened their hearts, their souls, the very marrow from which creativity flows. And to all of you who attended, we were not only honored to work with YOU, we were humbled by your brilliance. Thank you, my friends. Thank you! 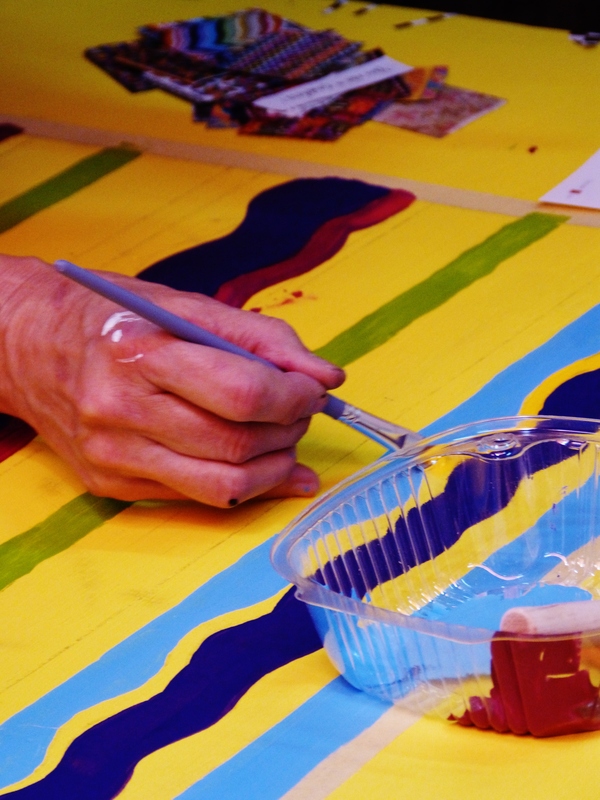 When’s the last time you took a creative risk? 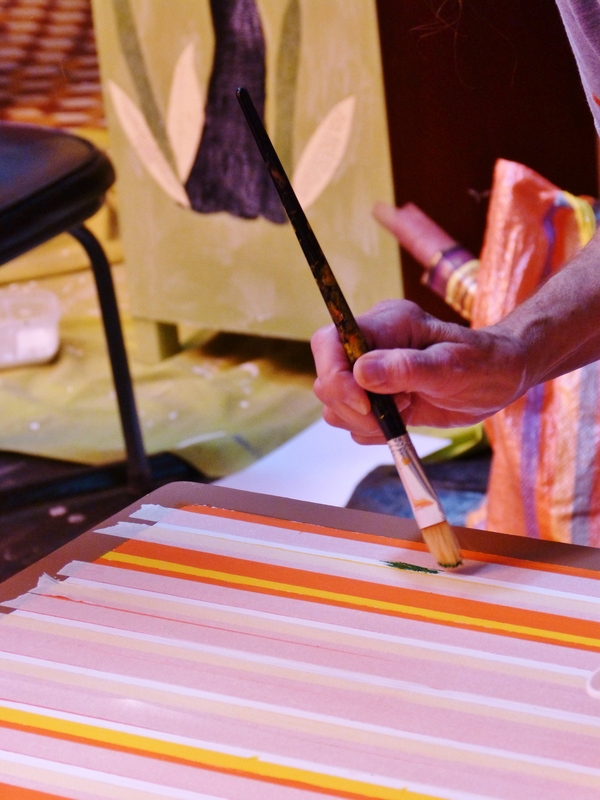 In what unexpected ways does creativity manifest itself in your life? A special thank you to Laura and Clay Bodine for hosting us in their amazing space, Fishbon Del Sur. Sara and I love you both! 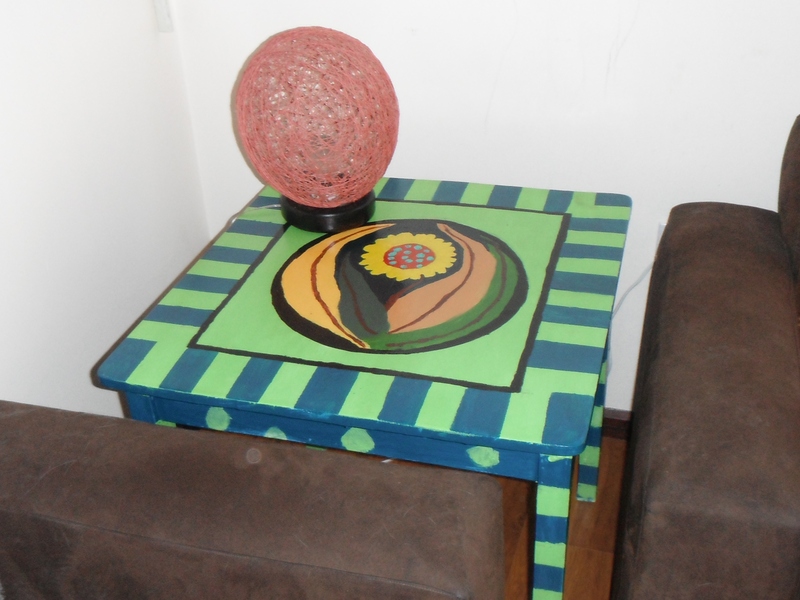 This entry was posted in art, decoupage, Ecuador and tagged art, artists, creative process, creativity, Cuenca, decoupage, design, Ecuador, furniture, idiomart, style, workshops. Bookmark the permalink. Oh, thank you so much! It was an amazing week with a group of incredibly gifted folks. We were blessed. I love it when I am able to learn from my students. What a gift they are! It’s wonderful to hear from you today, my friend. Hope you are well this Wednesday morning. Oh, good! Probably won’t have another class until August. We’ll see. Thanks for asking. Wow! It looks like everyone got into spirit of things! And I loved seeing all the different creations. All of us have some type of inner artist if we let it out. 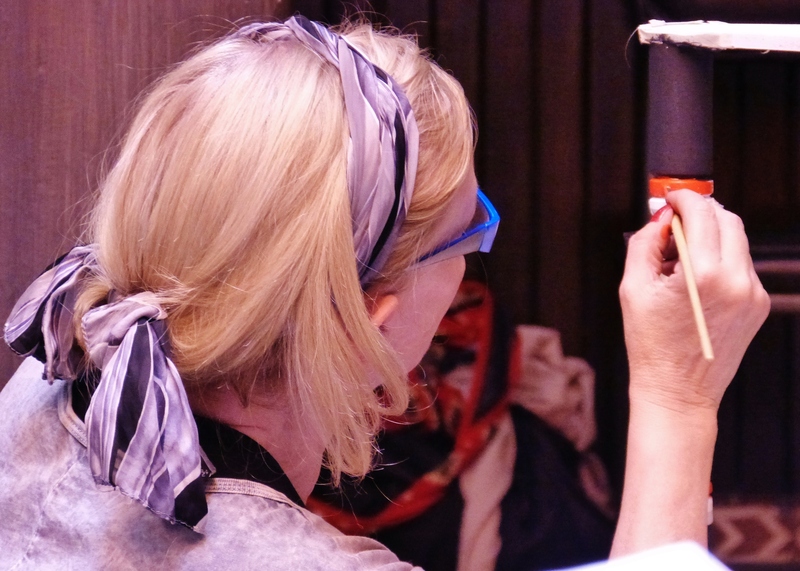 Yes, though many folks don’t realize it YET, all of us are creative–if only we can tap that artist within and allow her some form of expression. This was an amazing group to work with! Wonderful to hear from you today, TB! This is so awesome, Kathy. Congrats for pulling off such a successful workshop. Is this a new business for you? Thank you so much, Heather. It was a fun and productive week. Yes, we think this could become a new business for us. We will have to see. Wonderful to hear from you today! One of the things that has always stunned me is how a room full of people can do the same project and have completely unique and amazing results. This was a fabulous idea and I know one that will have a huge demand. We’ll done friend! Yes, yes, yes–NONE of them were alike–yet they were all taught by the same person. That tells you a lot–all really depends on the student–not the instructor. 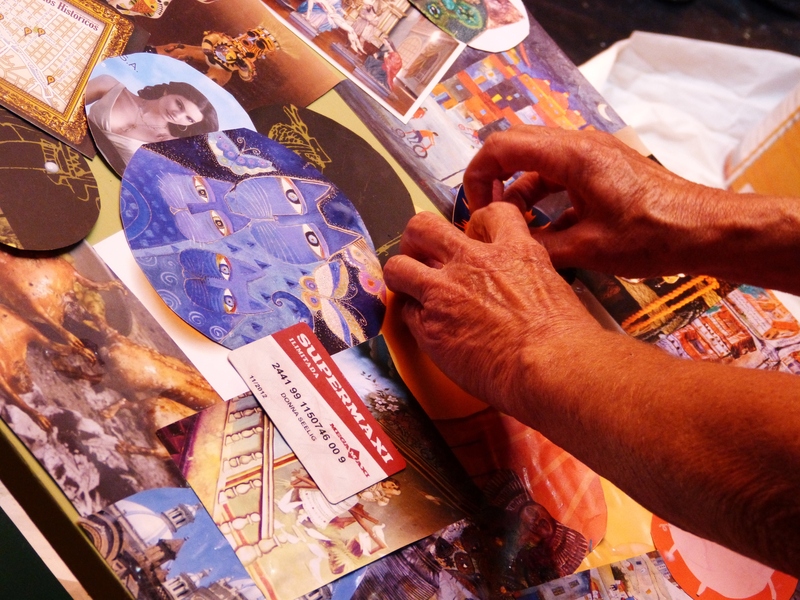 We were stunned how much we learned from these incredibly creative and gifted folks. Hope you are well, Emily. Wonderful to hear from you this morning! I am absolutely blown away by the explosion of creativity evident here. You must be a wonderful teacher and these women must harbour deep wells of creativity themselves. Wow! WOW! Each piece is wonderful and unique. I especially liked the sunfower, but would love any of them in my home. 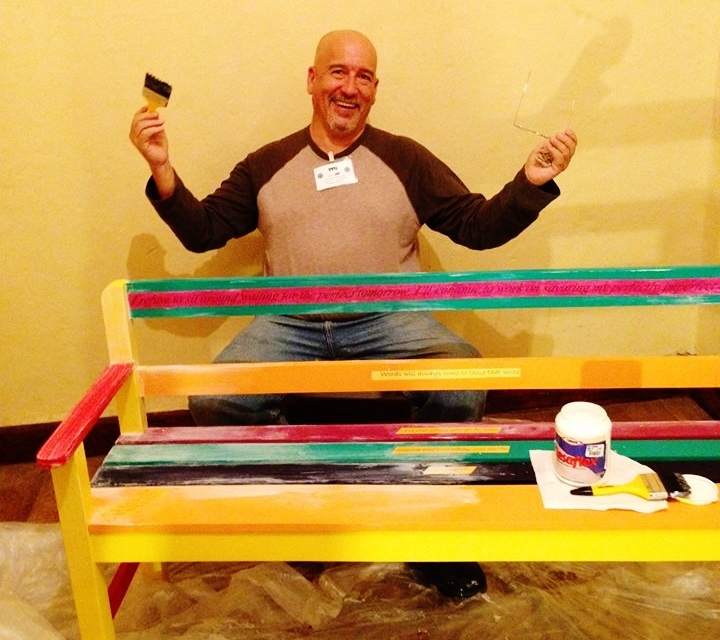 I’m sure that I would be your worst nightmare—I look at paint and more of it ends up on me then what I’m painting. I’m creative when it comes to ideas for other people. Speaking of which, I plan to show this post to my dear boy for inspiration. My mother too! 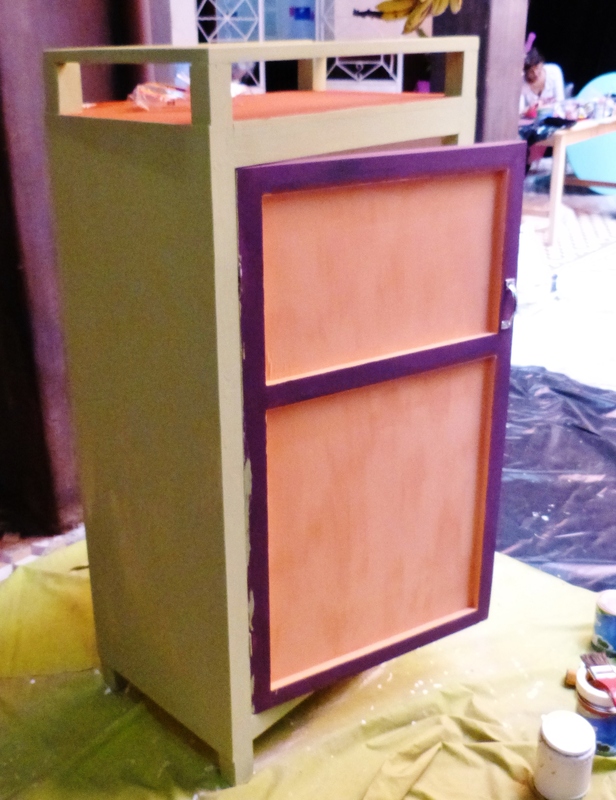 BTW, she painted fun dog crates for her dog show friends that were a huge. Kudos to you and Sara for nurturing the artiest in so many people and (knowing myself) I bet some of those participants were a bit shy and skeptical. Yippee! You have sun! That is awesome, Katybeth. Thanks so much for taking a look and even sharing with your mom and Cole. I’m honored. Your mother’s dog crates sound awesome. Did she take photos? That would make a fun blog post. And, by the way, I don’t think you would be a nightmare. Interestingly, NO one gets more paint of them than I do. I swear!!!!! Oh, the colors, the vibrant colors! There is no way I could choose a favorite. The techniques are so varied. It just goes to show that everyone has talent! Thanks for sharing these with us, Kathy. See you soon. Thank you so much, Debbie! It was an amazing week–with even more amazing participants. If only more folks were able to recognize the creative potential inside of them. Can’t wait to see you!!!!!!! Hugs to you, too, my friend. Wonderful to hear from you this morning, but it will be ever MORE wonderful to see you in person. Yippee! Every single piece was eye popping, left me with my mouth hanging open. Stunning Kathy, simply stunning. I can tell you are in your element. I am so pleased and happy for you. My fingers simply itch to come visit and make beauty, whether with my camera or anything else. Oh, just to gain some settling in my life so I can take a week and come learn from you! This was amazing, thank you for the visit to your workshop. It was wonderful. Thank you, dear Val! 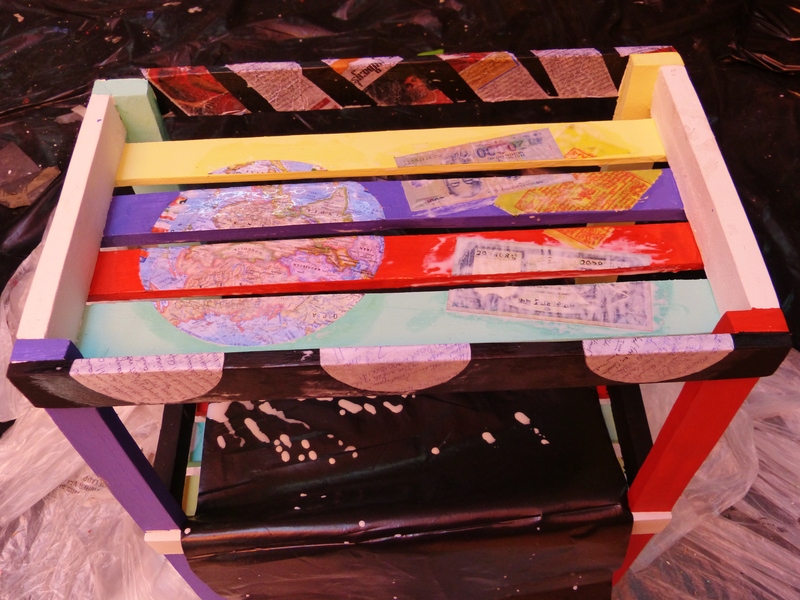 Interestingly, you can do some of these projects with just a bit of paint and lots of cool photos–so they can go together in amazing ways. We SO hope you will visit sometime soon. Just let us know when, my friend. Hugs to you in Dallas from us here in Cuenca. What wonderful results! It sounds like you had a great group and that everyone had fun. It’s the best when the teachers come away inspired by the students! That happens to me all the time! Thanks for sharing these lovely images, Kathy! Yes, yes, Cindy, YOU would understand about being inspired by and learning from your students. Isn’t it the best? We DID have a great group and it was TONS of fun. Hope you are beginning to thaw up in your neck of the woods. Thanks for stopping by–I love hearing from you! Holy WoW Picasso ! You all did this in a week? Truly amazing ! I think these people were holding out, waiting for the moment and space to be inspired. Kathy and Sara you offered them at space and inspiration ! YES, JEFF, they were holding out! We were frankly stunned by the outcome. And a number of these folks had NEVER done anything like this before. We were and are blessed. Thank you, my friend. You are a sweetie! So, when are you going to visit? 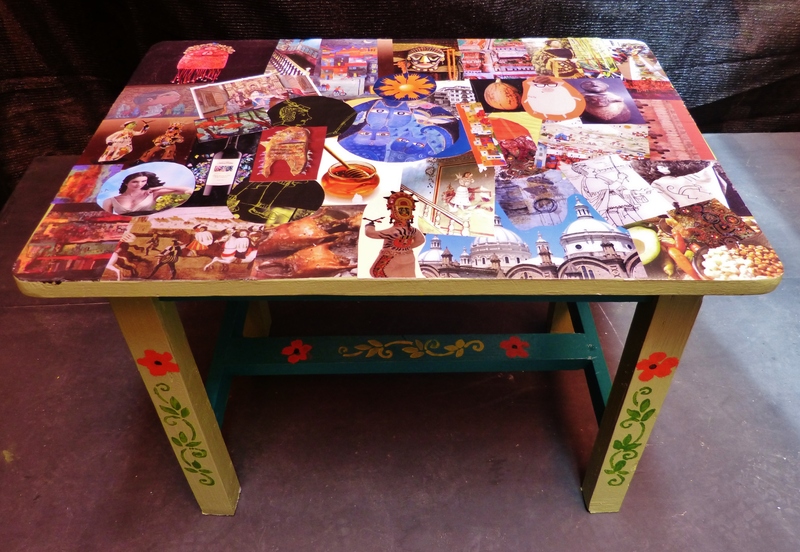 You could do some amazing furniture projects with your stunning photos! Hugs to you in New Jersey!!! Ah, we would love you and your mom to find your way here! Yes, it would be quite a trip from all the way in Georgia. I’m happy that you were able to take a virtual trip this morning. Hugs and hogs to you, dear Bacon! Thanks for snorting by, my friend! 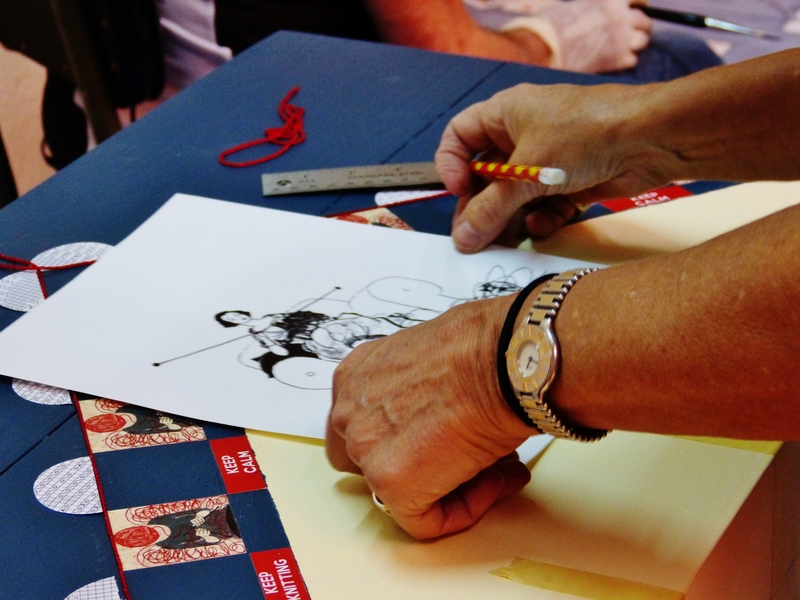 “the creative process involves more sweat and effort than we bargain for” Isn’t that the truth? Loved your photos! 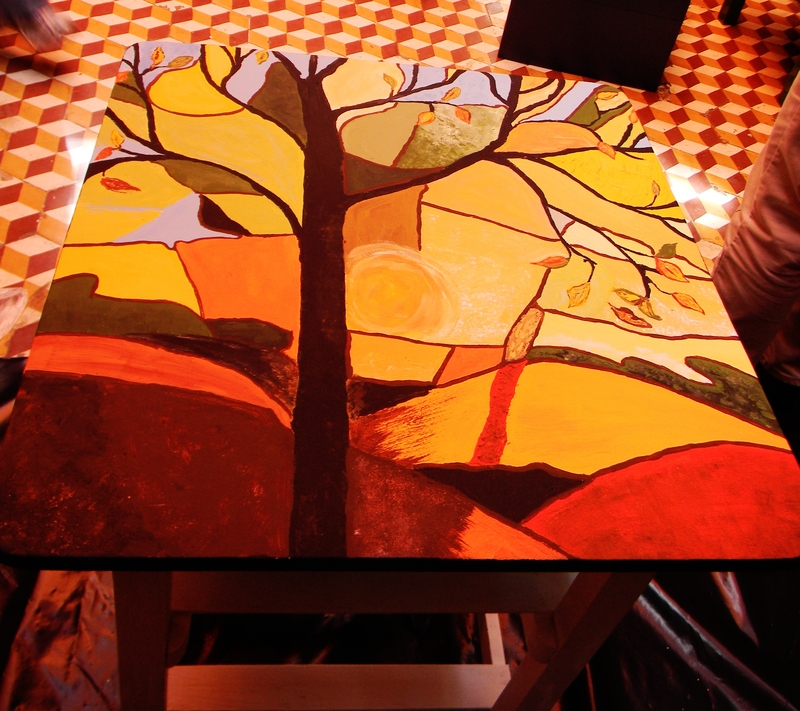 The table with the tree was my favorite! Oh, thank you, Nora! 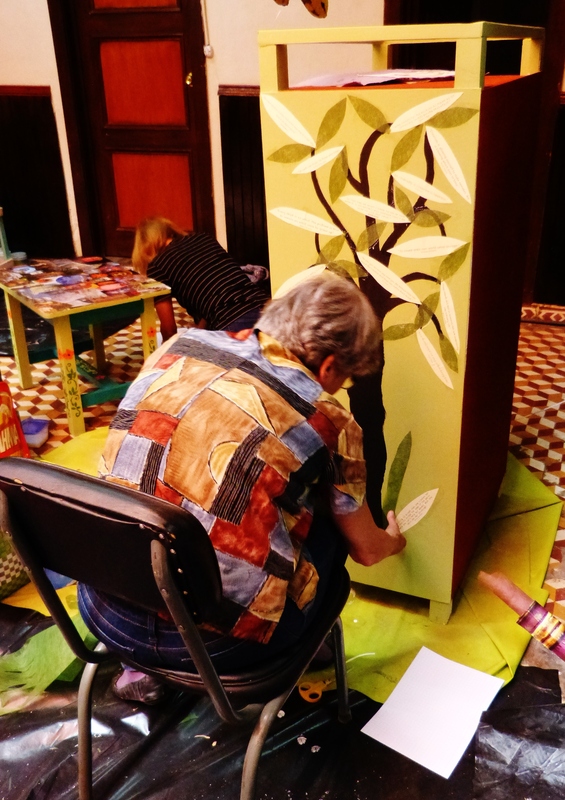 Interestingly, Brenda, who painted the tree, had NEVER done anything similar before. She was amazing. I will let her know how much you liked it. Great to hear from you today! Please do! It really stood out to me. I hope she does more like it. Gonna email her in a bit. Thanks again, Nora! I love teaching because I learn so much from my students. This looks like an incredible class. What a fun and talented group of people. Beautiful project! Oh, thank you so much, Lisa. I always consider it the mark of good teacher when they are open to learning from the ones they are ostensibly teaching. Doesn’t surprise me AT ALL that you fall into this category. We’re these folks amazing? We feel very blessed to have worked with them. You are such a sweetie! But, YOU fall into that category, as well. Like you, I prefer to write one good post per week–not post mediocre stuff more frequently. I just can’t manage the latter. In fact, I am always stunned by the bloggers who manage it. Thanks for the congrats on Freshly Pressed! It’s always an honor to be recognized, as you know. I LOVE hearing from you, my fried. Thanks for your comment! So bright and colorful!!! 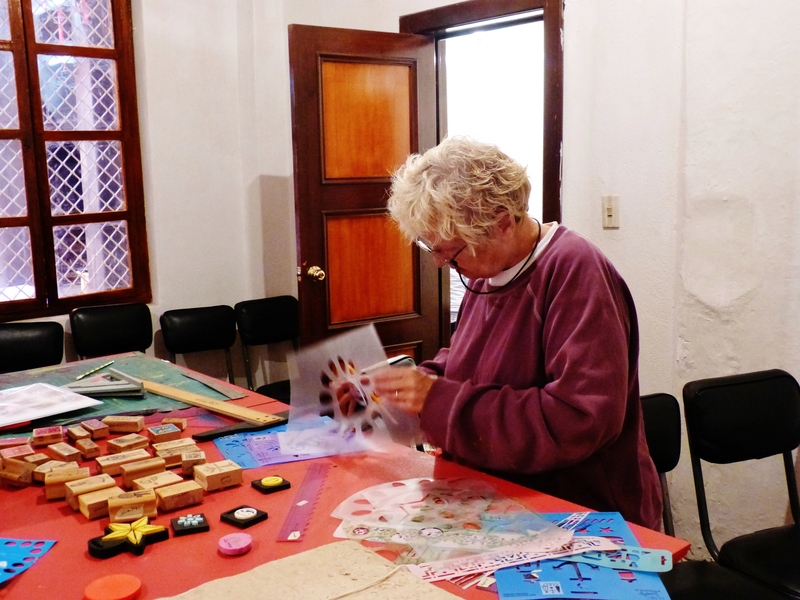 What a wonderful way to create something one-of-a-kind and very personal, yet sharing the experience with others. Ha, ha! 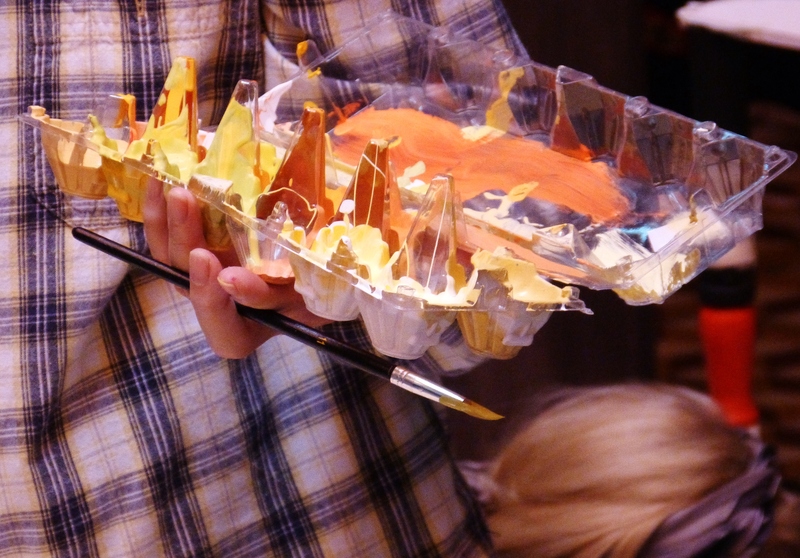 Doesn’t surprise me that you did well with “fairy garden.” It would be hard to imagine success with the egg project. We have some of those eggs that Sara brought home on a trip. They require a staggering amount of skill, at least it seems that way to me. Hope you have a wonderful Wednesday, my friend. And thanks so much for stopping by! Over the top wonderful! Congrats to all who participated, the creativity displayed is inspiring to say the least. Oh, thank you so much, my friend. I appreciate your taking a look and leaving a comment. It’s wonderful to hear from you! 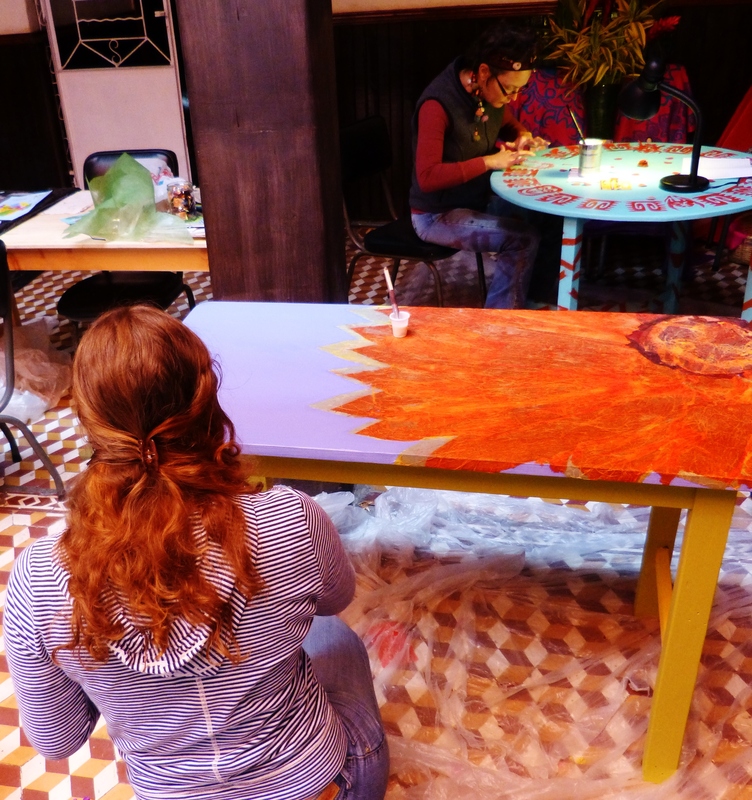 Would love to have you in a workshop some day! Ha, ha! We should have done evaluations. I’m afraid we didn’t. However, we did get some good feedback about things we could do differently–for which we were grateful. LOVE hearing from you, Charlie! 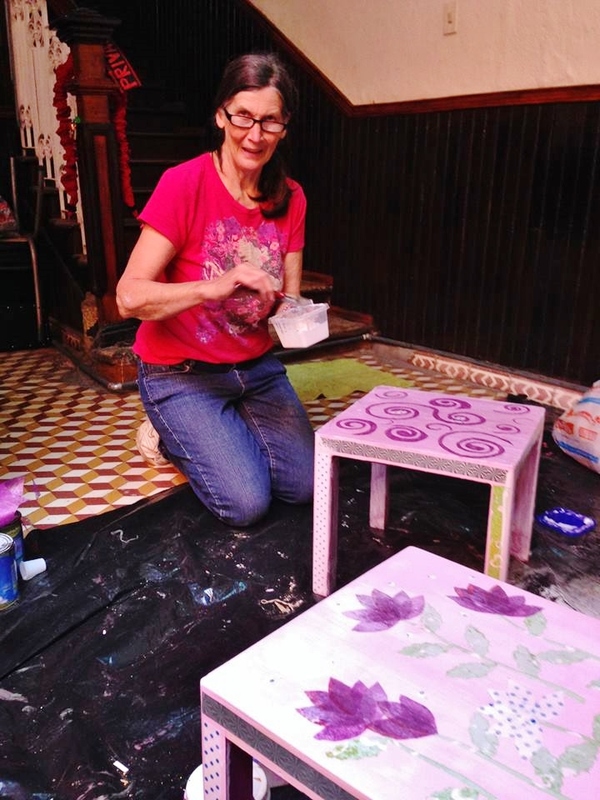 Your students were all such gifted artisans, Kathy (and Sara)! I’m very impressed. 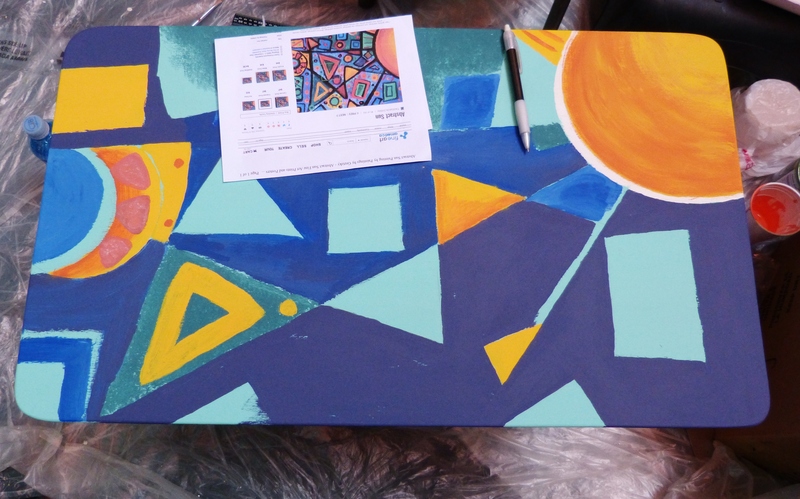 Since I can barely paint a white square, I would have been intimidated in the presence of such skilled creative types. Every time I change the sheets on my bed I’m taking a creative risk since I bang my knee on the corner of my platform far too often. I suspect that was the type of creative risk you were hoping to conjure. Creative risk, indeed, V! Hell, I risk my life every time I walk down the hall to the bathroom, I’m such a klutz–not that you’re one yourself. I know it looks like they were skilled creative types, but most had never done anything like this before. It was kind of amazing. Maybe your white square would be a stunner! Great to hear from you, V! Guess what Sara and I are getting ready to celebrate in two days? You helped make it possible. Thanks again for that, buddy! You and Jackie are awesome–apostilles, dumplings and all! Ah, thank you, dear V! Nothing like anniversary wishes from Bedrock! Thank you so much. I thought they did an incredible job! 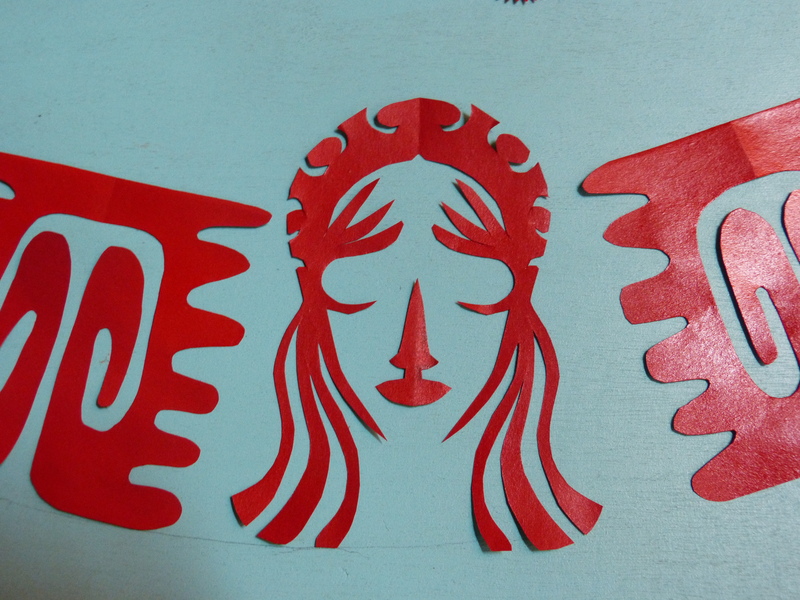 Wowie wow, what an amazing job every single one of those pieces turned out to be! I went through them very slowly, taking in all the cool techniques and colors, how fun that class looked to be! 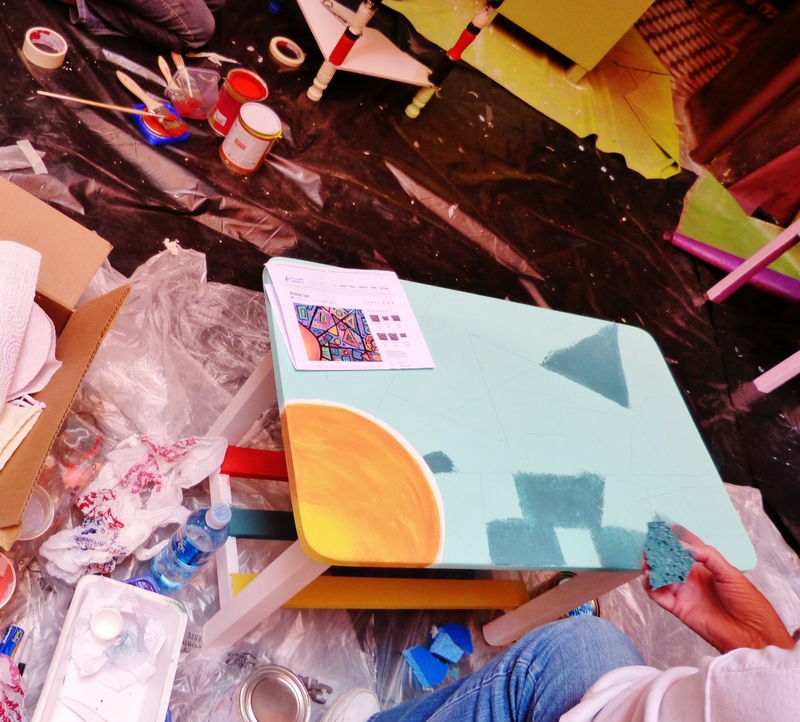 I’m sure everyone was very happy that you had the class for them to create such great pieces of art furniture, how nice of you! So glad you enjoyed looking at the photos and examining the techniques that folks used. When you move here, maybe you can attend a workshop too. It’s always wonderful to hear from you, dear Sue. Hope you are well! Thanks for stopping by and taking the time to leave a comment. I think my latest novel-in-progress is a creative risk. It’s a different style of writing, different POV, and definitely a different subject matter. And a blast to write, I might add…though that process is s l o w going. 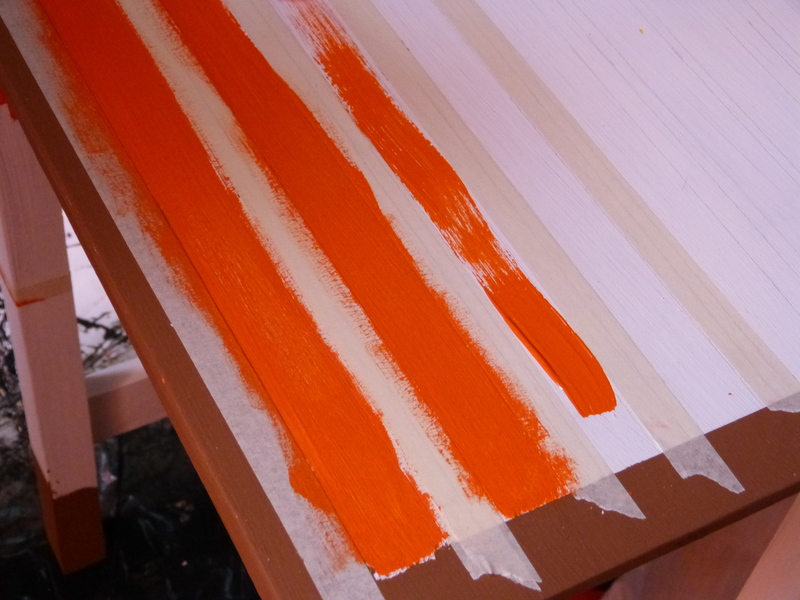 Seriously, paint would dry quicker than words appearing in my manuscript. 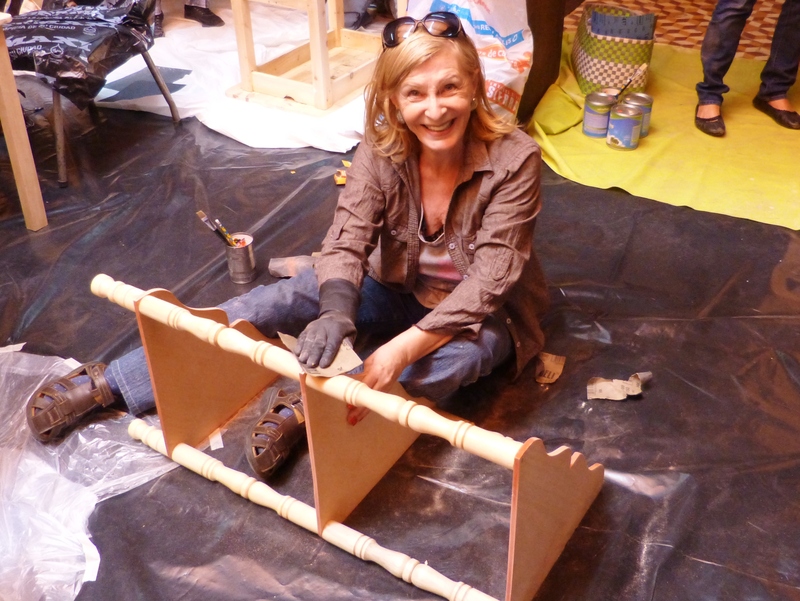 I can’t think of a more perfect person to teach a creative furniture workshop. Glad it went so well and you made new gringo friends! Interesting. I had no idea you were trying a new POV in our new novel. That must be fun, indeed. I fear I know a thing or two myself about slow writing. It’s agonizing in a way–but still we continue. Not sure what that’s about. Great to hear from you, Mark! Hope you and Tara are well this week! Wow! Wow! Wow! What a neat experience. Thank you, Diane. It was an amazing week. I appreciate your taking a look and leaving a comment. It’s always great to hear from you! 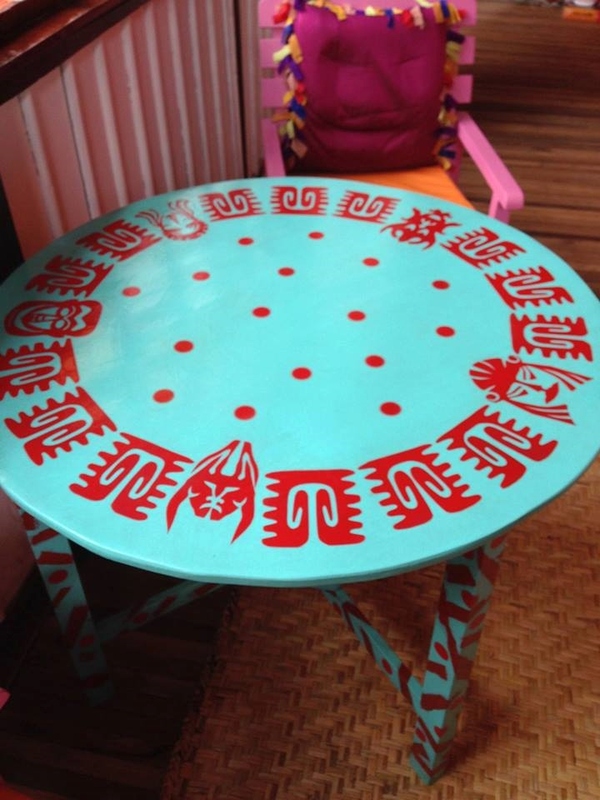 LOVE the Incan table! Sad that I don’t live in Cuenca. I wish there were things like this here! I will tell Laura how much you enjoyed her table. There have got to be similar kinds of workshops in Cleveland. However, I’m sure they cost a LOT more. That’s the part that keeps a lot of folks away. Sad. Hope you are doing well, my friend. Hugs and love to you from Sara and me! Absolutely amazing! How lovely to have one of these greeting you everyday. Thank you for having a look and taking the time to leave a comment. 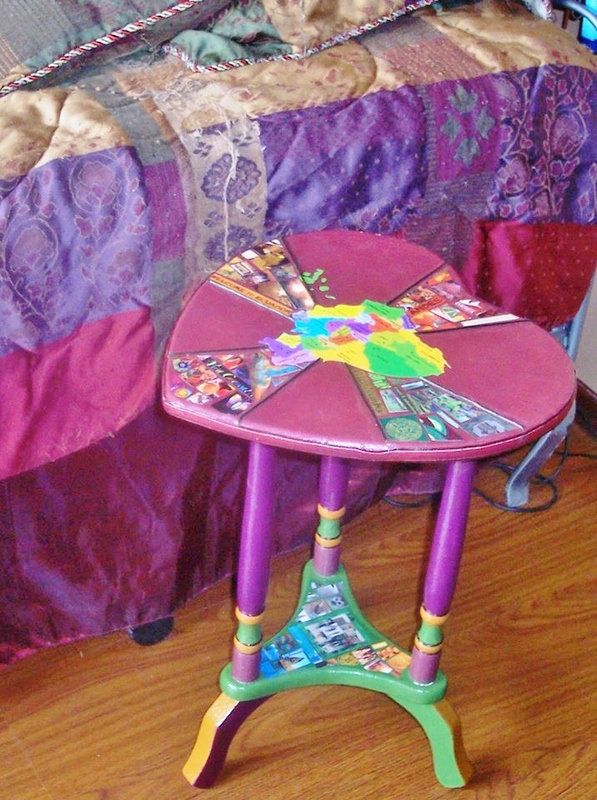 I’d love to come home to these tables, as well. 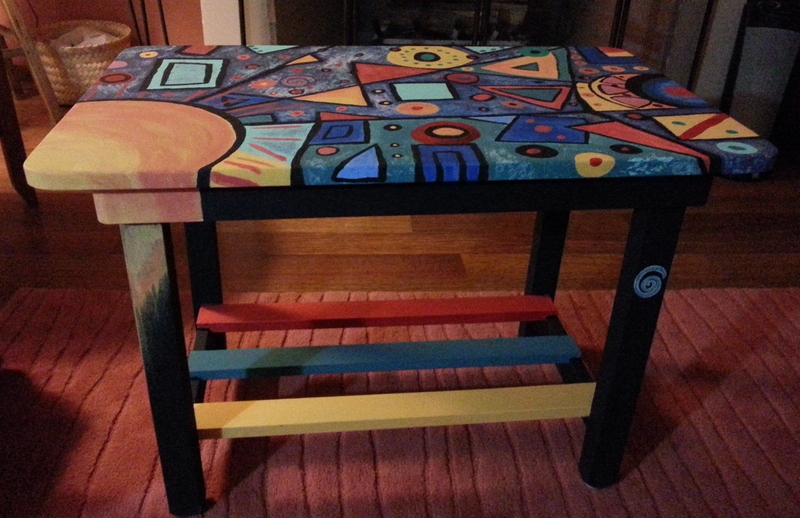 In fact, I mentioned to a few folks that I had “table envy.” Hope you are doing well. Wonderful to hear from you! How fun to bring everyone together in such a creative way!! Thank you, MJ! So glad you enjoyed everyone’s work. They all did such an incredible job, and some of the most amazing outcomes were managed by folks who had no previous experience. Great to hear from you, my friend! Kathy – “Stunning” is a gross UNDERstatement. I adore that you and Sara have shared your hearts, your time, your talents. Rock on siSTARS. Rock on, indeed! Thank you, Laurie. It was an amazing week. We expected it would go well. We just hadn’t imagined it would go SO well! Thanks for taking a look and offering your feedback. It’s always so wonderful to hear from you! So glad you enjoyed seeing everyone’s work. They were quite an amazing group, most of whom had never done anything like this before. Your birdcage find sounds really cool. You could always clean it up, spray paint it, and hang it in the bathroom for towel storage. Thanks so much for stopping by! Hmm it might not be big enough for towel storage, but that is a fantastic idea… Will file that idea in my brain for sure. One of my lovely friends is turning 30 soon and she loves up cycling, I am toying with the idea of turning it into a succulent/herb planter that she can hang outside her back door for easy access. I have done some research on it and it is doable (meaning the plants can thrive that way), but I need to go into the local plant store and speak with a horticulturalist about my plant choices. Wow, that sounds like an awesome idea! Sorry it has taken me a couple of days to respond to your comment. We have had guests from the US. Hope your week is going well. What beautiful pieces were created! I wish I had such creativity… or more accurately, wish I had more time to nurture such creativity. Yes, you have hit on something quite important here, Terri. 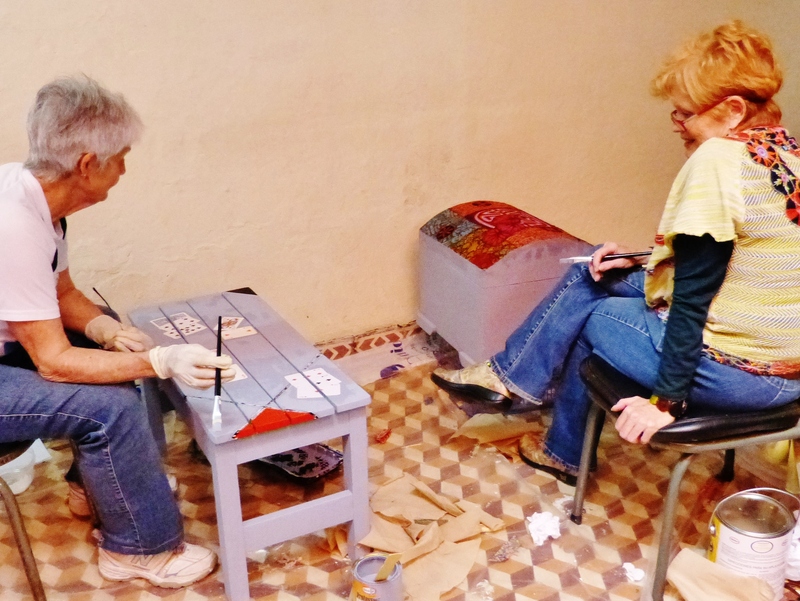 These women are newly retired and for the first time in their lives, they have time to take on these kinds of projects. I was just explaining that to someone today. Thanks for stoppingby. Hope your week is going well! Oh, you are too sweet, Colleen. It was a fun week and the participants did incredible work. I hope they realize that–though I have said so repeatedly. Would love to attend, were you to live a wee bit closer. Hugs to you and David! Kathy where do I even begin .. I loved every piece of work. I’m not kidding. 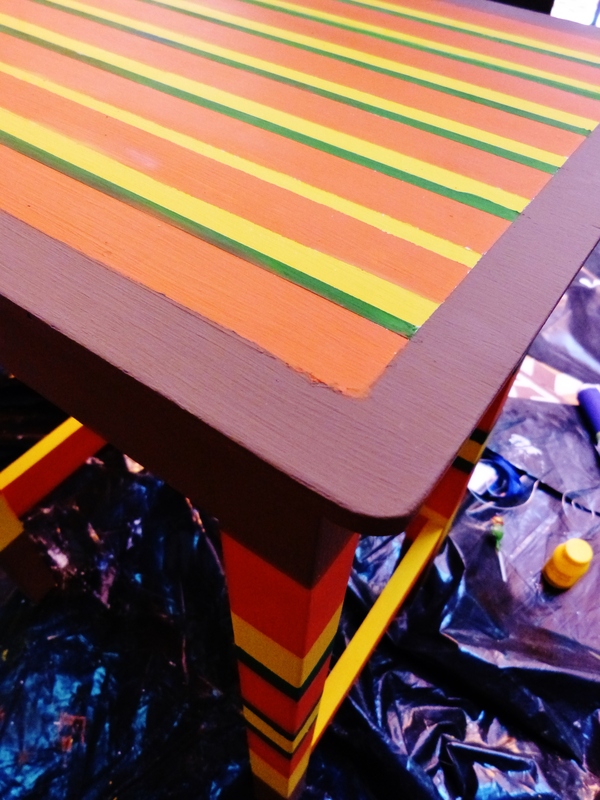 I’m so drawn to bright colors that I wish I was at your work shop. I would be a complete beginner and yet I think, I would thrive in that environment. 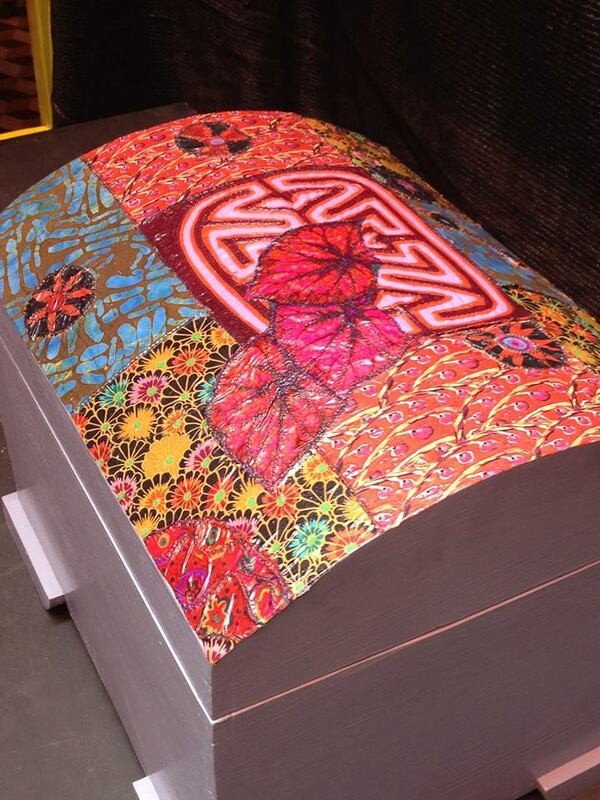 So many beautiful creative minds together; my favourites were Bobbi’s fabric chest.. Stunning. 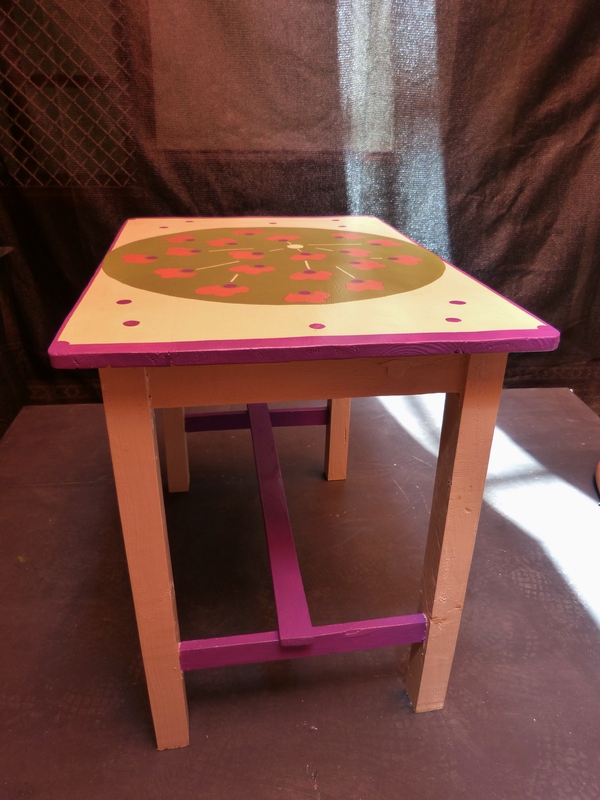 Michelle and Paige’s sunflower decoupage – I love bright orange and lavender/ purple together and the lovely lady who did some dot art that reminded me of some beautiful Australian Aboriginal artwork i love. You inspire me as always. Thinking of you and Sara. I am off to Sri Lanka in a month. Oh, have a wonderful visit to Sri Lanka. I’m off to visit the US in about a month. 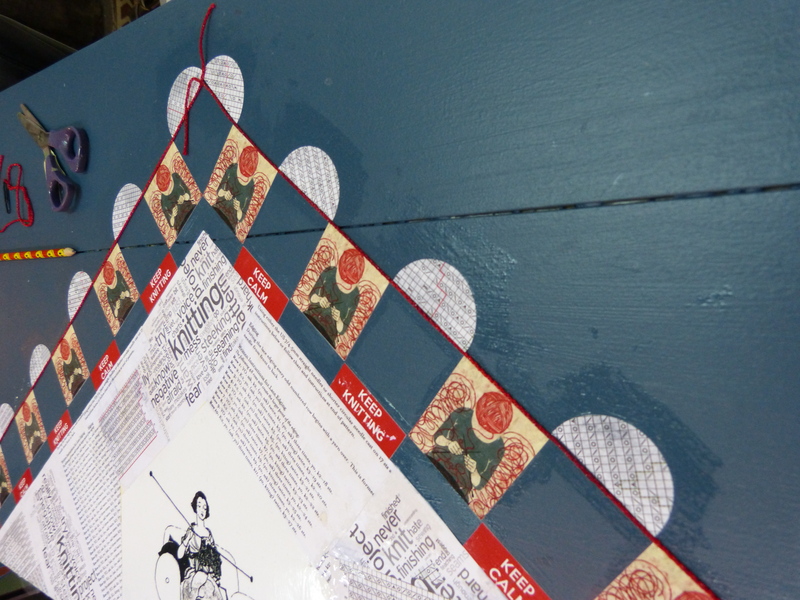 I will pass along your compliments on the pieces that spoke to you. 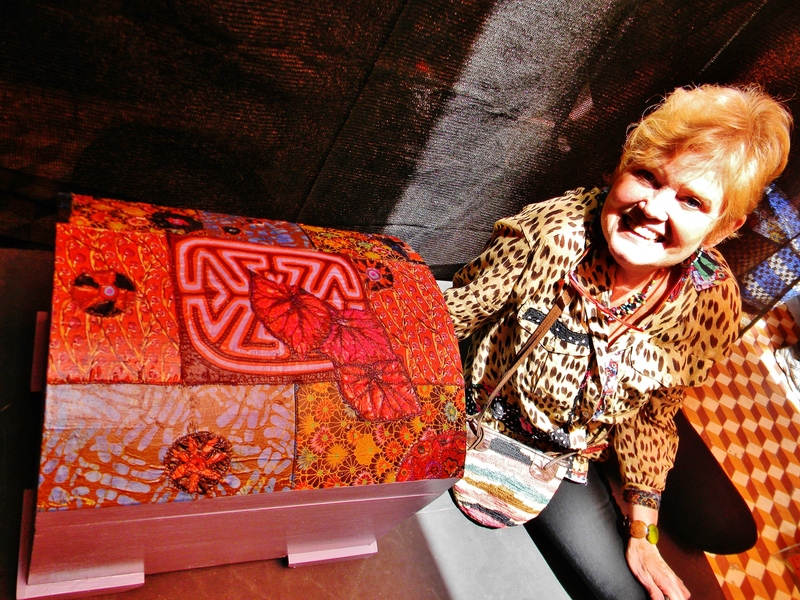 And yes, the aboriginal work was quite purposeful in Christine’s mind. It’s always wonderful to hear from you, my friend. Hugs to you, too!!! Thank you, Gertie. So glad you enjoyed seeing the work my students created. 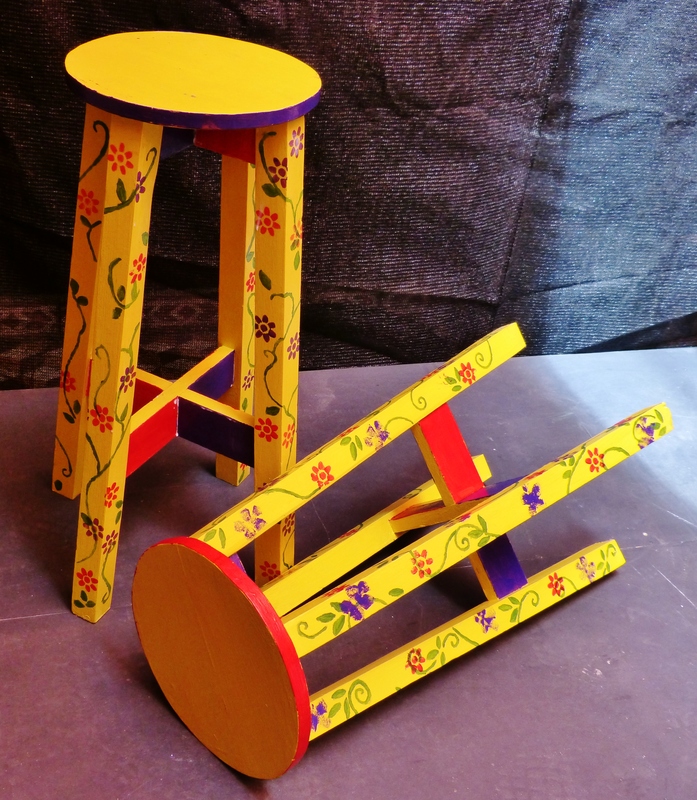 I have done some tutorials, but nothing on stools. I will work on that for you. Promise! Hope you are having a lovely week, my friend. Whatever you and Sara did in the workshop, you clearly gave everyone the confidence to follow their own creative path and the results are just stunning. Cuenca must surely be in the running for the world’s most colourful town. Thank you, my friend. It was a fun week. Good luck with your post-grad work. I will miss you, but will love hearing from you whenever you find the time. But, gosh, I understand. Education is awesome, my friend. Hope you all are well! What a wonderful week for you and your students. Such beautiful results. Thank you, Sandy. It was, indeed, an incredible week. 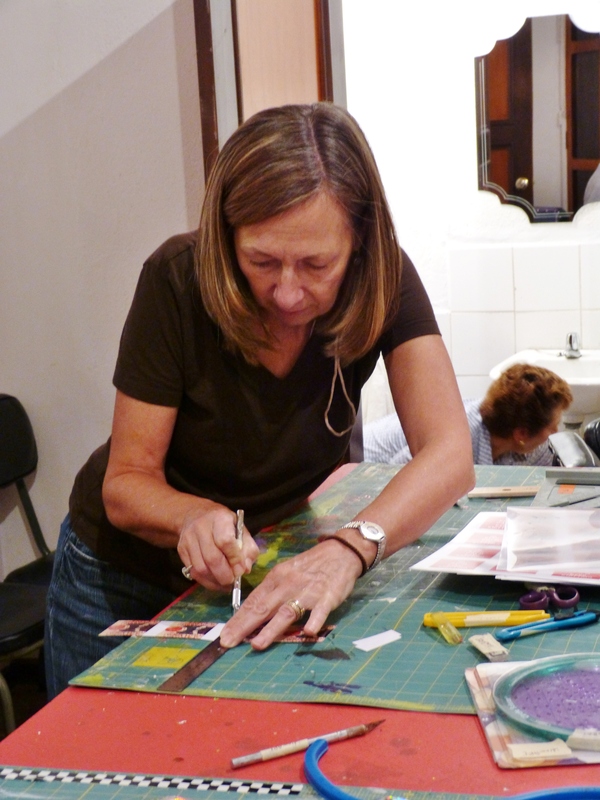 I will share your kind words with the folks who enrolled in the workshop. Wonderful to hear from you! Oh, thank you so much for taking a lot. I will share your kind words with my students. They are an amazing group. Wonderful to hear from you today. Hope your week is going well! Amazing, amazing, Kathy! I loved the creativity pouring through these photos. 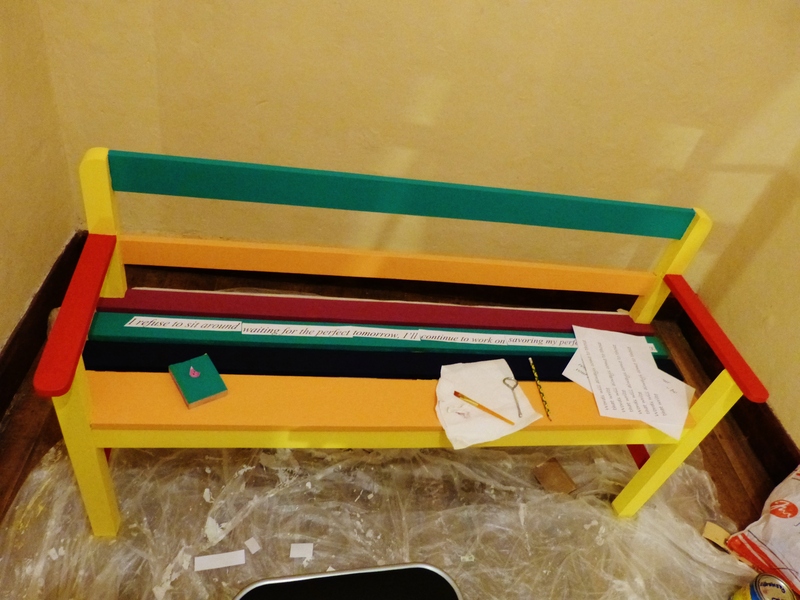 Thank you for sharing the “in progress” photos. I really enjoyed watching the projects come to fruition. I look at this beautiful work and wonder if I would have the courage to do it! 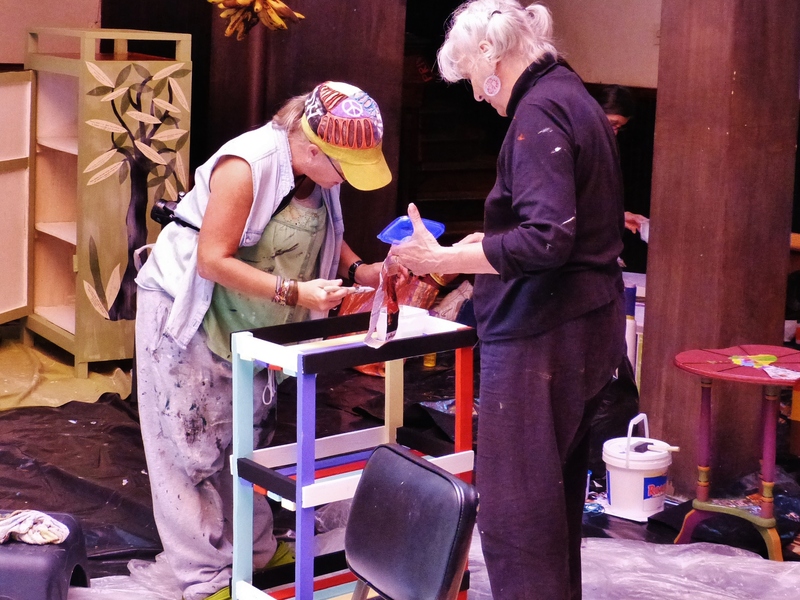 Is this a workshop that you organized and taught, or were you hired by an arts center to teach? Great question. We organized the workshop, recruited students, and taught. One of my friends here has a studio space we were able to use. 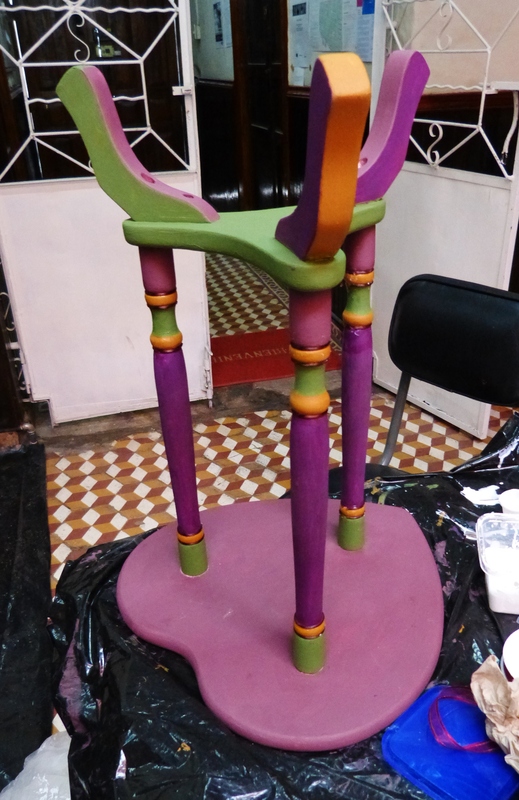 Glad you enjoyed seeing the in-progress photos. I suspect you would have the courage, Jackie. It was an incredible week. Hope you are having a lovely Thursday, my friend. Well, you do that then. The furniture really does look great. Now, y”all need to package it up and ship it to moi. Oh, Kathy, now that I’ve seen the results of your class I am even more bummed that my schedule had conflicts that prevented me from attending. August? I’m in! Let me know as soon as you finalize the details. You and Sarah are truly a creative inspiration! Ah, thank you, Carolyn. That’s how I felt about missing your workshop. 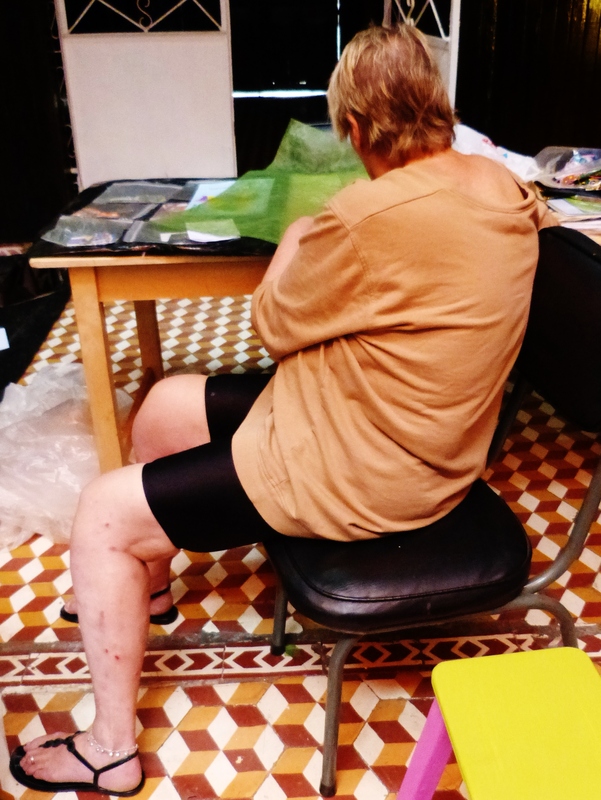 That’s how I felt about missing your art journaling workshop. It was my birthday and we had plans. Alas. Will let you know about August. Thanks so much for stopping by! Not only are you and Sara amazing and talented women, but you know so many talented, creative people. This move to Ecuador has done you both a world of good. You are living life to the fullest! Love the bold colors as always. 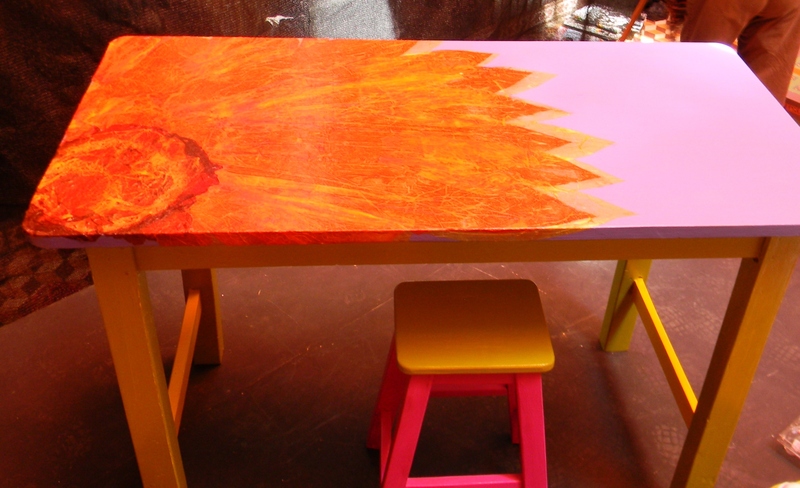 Favorite is that table with a huge orange flower and pink background. I want one! Okay, I must admit, I’m crazy about that one, as well. 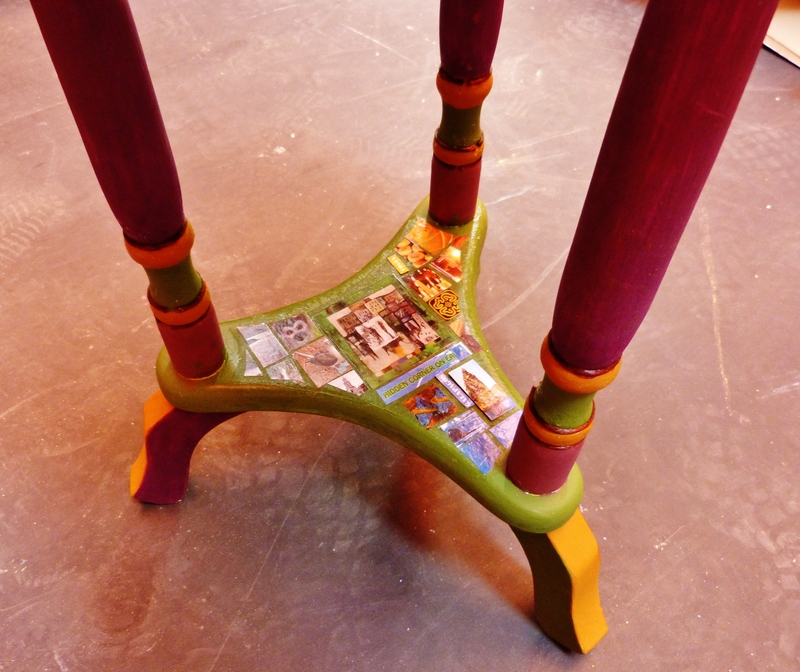 In fact, that piece left me with huge table envy. I will pass along news of your appreciation. Happy Tuesday to you, my friend. Thanks for stopping by! Oh Kathy! What a great workshop. The creative process is so beautifully captured. 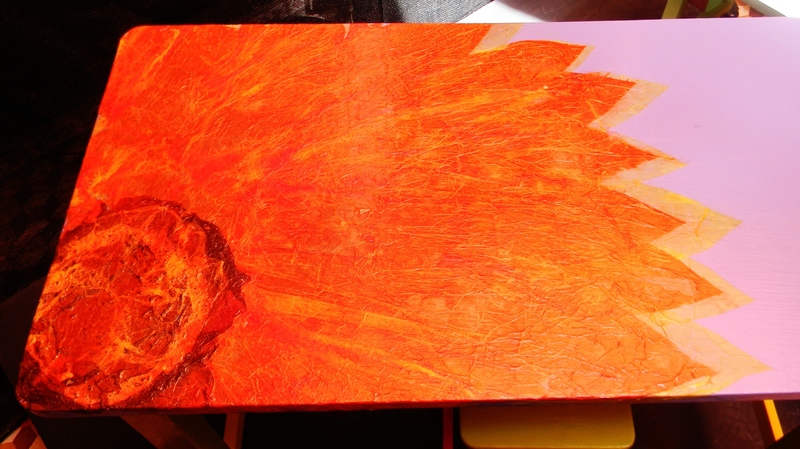 Each piece is magnificent although it cannot be denied that the Sunflower burns with particular brilliance! Bravo to the Artists and congratulations to you and Sara for mentoring the group. 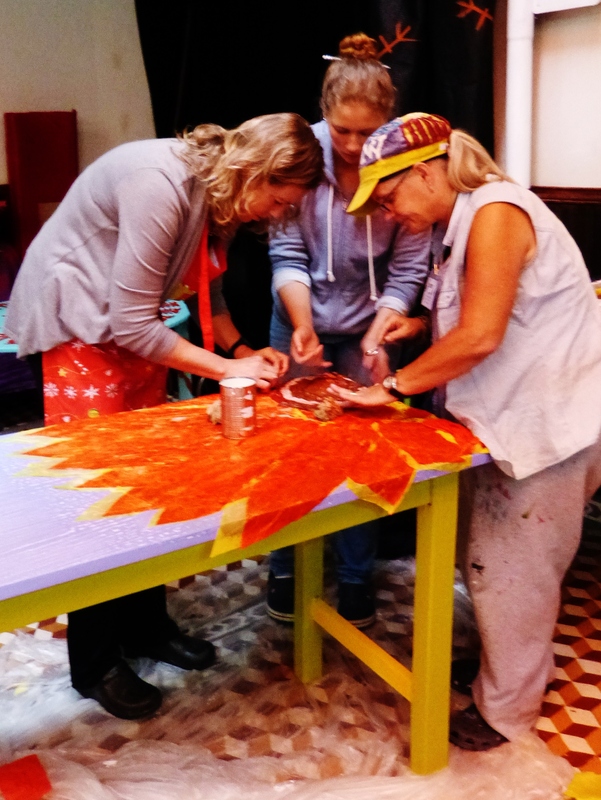 I love the way you describe nurturing the Artist within, to do that for someone in a supportive workshop like this is a treasure so three cheers! 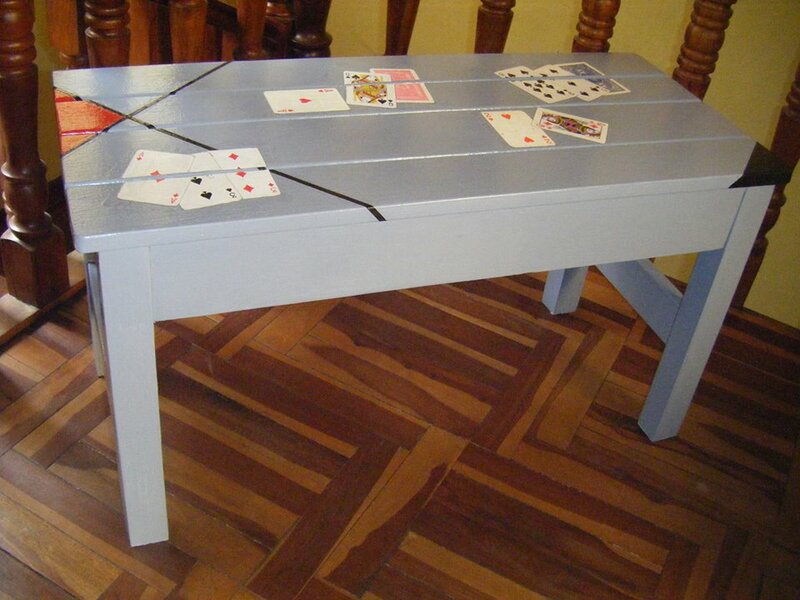 I am inspired to look at bits of furniture I can at least improve the look of. The ‘can do’ attitude of your process is terrific and a bit contagious (hurrah!). Thank you so much, Lita! I’m delighted to hear from you, as always. 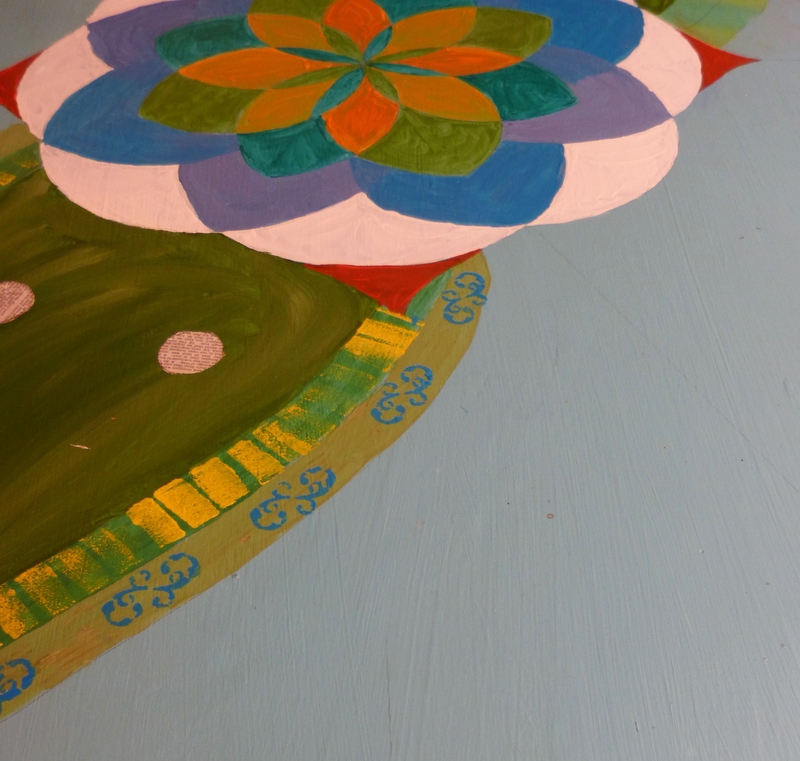 Interesting that you, too, appreciate the sunflower piece, as I absolutely adore it. I’ve been thinking I may need to do one myself. Hope you are doing well, my friend. Sorry I’m a few days behind on reading and responding to comments. We have had house guests from the US. Hugs to you, too!!! Wowsza! Those are fantastic and amazing. I had seen a couple of items posted in the FB groups, but I had no idea you and Sara were the facilitators of the workshop. You sure brought out the best in everyone’s artistic expression. I hope you’ll do it again and that I can participate once I’m there! Oh, how fun that you had already seen some of the pieces on Facebook. Yes, Sara and I were the facilitators. It was a fun week, to be sure. Glad you got to see photos of everyone’s work. Wonderful to hear from you today. When will you be coming to Cuenca? I forget. I really, really enjoyed these photos, Kathy. 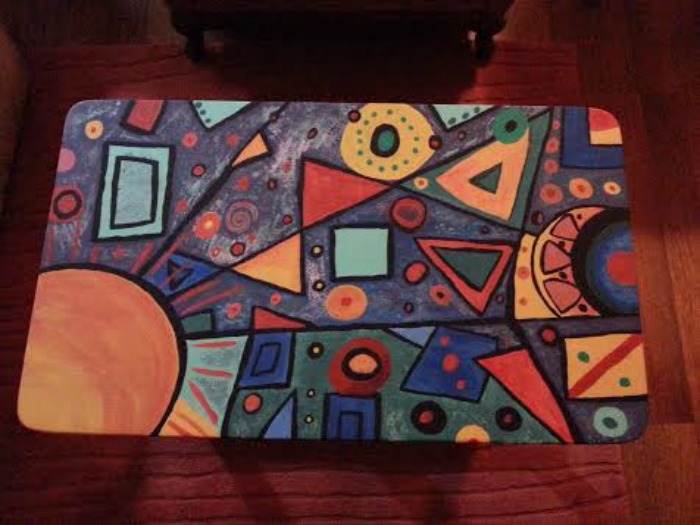 Each piece is so unique and I’m sure captures a little of the personality of each artist. What a great workshop. I would have really enjoyed participating. I really respond to the bold colors and large graphic designs. They would add so much fun to any room. I am delighted that you had so many participants. 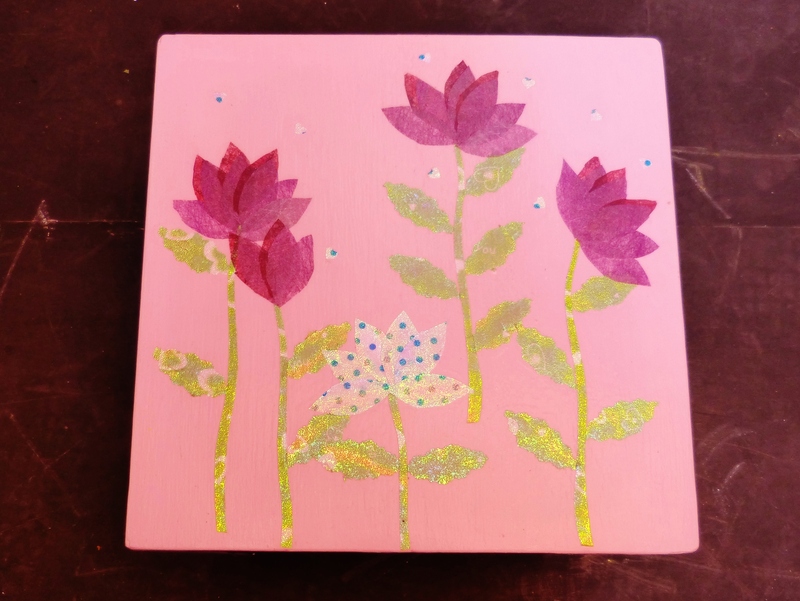 I can imagine that you and Sara create a really welcoming environment for both the skilled artists and those like me, who love to play with paint, but need a little encouragement. 🙂 Now that the workshop is over I hope you can enjoy a nice slow weekend, perhaps! Oh, thank you so much, Debra. Glad you enjoyed seeing everyone’s work. There was a definite mix of talented folks and others who had NEVER done anything like this before. However, the inexperienced in a number of instances surpassed even the experienced artists. Wonderful to hear from you today. Hope your week is going well. You and Sara are so darn inspiring, Kathy. Hey, did I tell you I just entered a contest to win a trip to Ecuador? If we win–can we visit you? *smile* Nice to be traveling around the blogosphere again, at least. OMG, it would be awesome if you won the contest and came to visit! We have two guest rooms, so even if you don’t win, you should still come! Wonderful to hear from you, Kathy. Glad you enjoyed the post and are back in the blogosphere again! Cheers to your work and the work put forth by the participants. My favs were the ones by Rita and Brenda. Oh, thank you, Frank. I will share with Rita and Brenda how much you enjoyed their work. Wonderful to here from you. Sorry to have been so slow responding to your comment. We have had house guests from the US and I haven’t had time to be online at all. No apologies necessary. Hope they had (or still having) a good visit. Thank you, Frank. It’s been a whirlwind, but they leave this evening. Wonderful visit! PS: … Cheers to the anniversary! Wow!!!!! So incredibly creative and talented you are Kathy!!! Oh, thank you, Nicole. I wish I had created any of these. The fact of the matter is, they were all done by the students who attended a workshop I taught here a couple of weeks ago. I will accept your praise on their behalf. Wonderful to hear from you, and congrats on being Freshly Pressed. That post REALLY deserved the recognition. 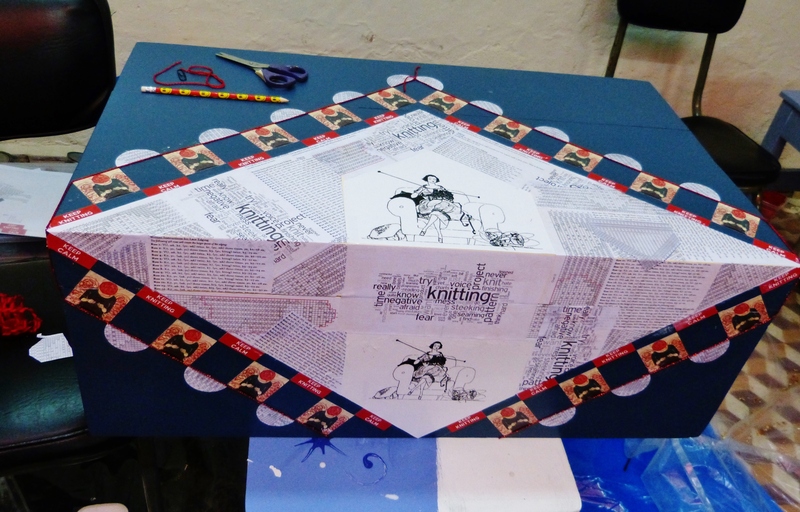 I just knew that the workshop would be a success and look at what your students produced. Amazing work! Thank you, TiTi! It was a TON of fun! So glad you predicted accurately. Love hearing from you, my friend. Thanks so much for stopping by! Stunning stuff, Kathy. Your artisans really did put their hearts and souls into this. 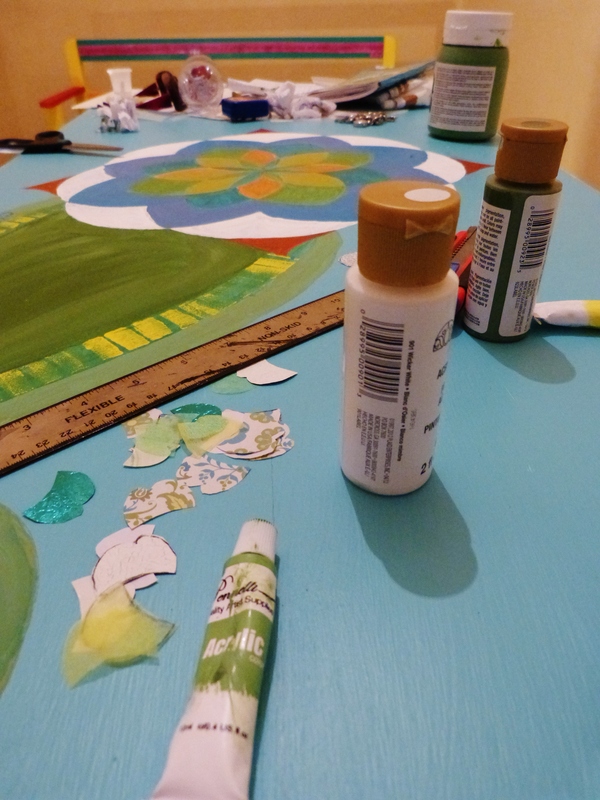 As far as my creative genius goes, it would not occur to me to paint a picture on a tabletop rather than on a piece of paper to be framed and hung on a wall. How wonderful for you and Sara. The gems of knowledge we learn from our students are the best, I think. 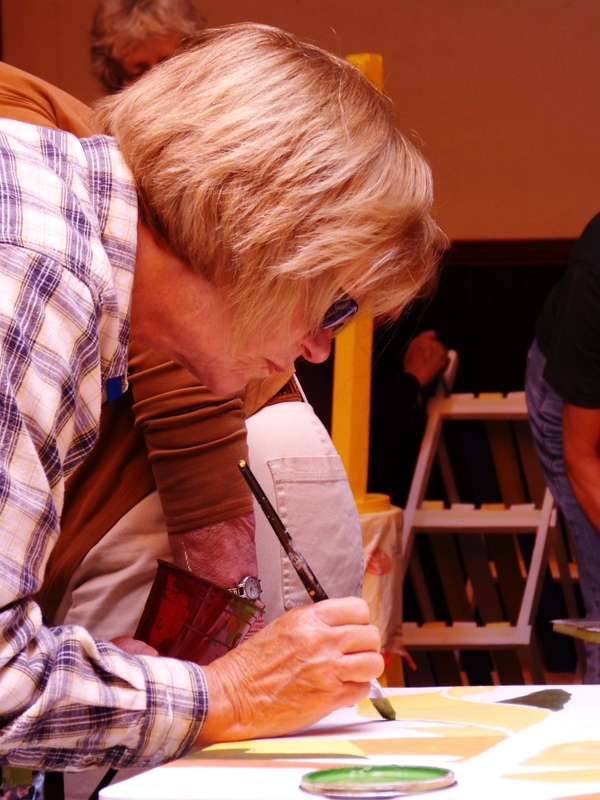 Will you be making this an annual workshop? My creative risks occur every time I publish something I’ve written, the last one a couple of days ago. I’m always afraid the reader(s) will roll on the floor laughing — “What idiocy! Is she nuts?” But, so far, so good. 🙂 That and like what V. says — like when I reach my arm into the cabinet under the kitchen counter and rip half the skin off only to find that the sole Band-Aids in the house are of a size to cover the scratch on the pinky finger of a four year old.